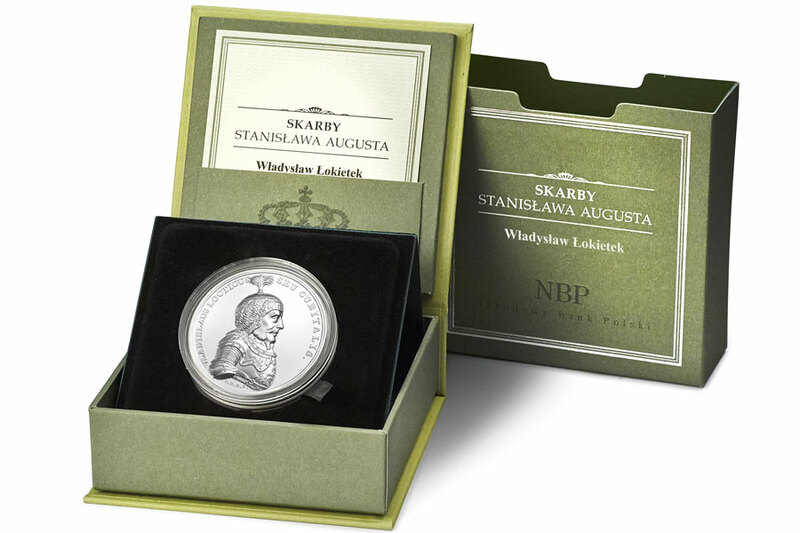 Issued by the National Bank Of Poland (NBP), also known as the Narodowy Bank, Treasures of Stanislaw August is a rare gem along the lines of the Monnaie de Paris’ superlative From Clovis to Republic series. Whereas that series took a modern designer, Christian Lacroix, and reinterpreted the styles of history for a modern, themed look, this series is firmly rooted in a historical source. The last king of the Polish-Lithuanian Commonwealth was Stanislaw August Poniatowski, and around 1790 he instructed a pair of talented medallists, Jan Filip Holzhaeusser and Jan Jakub Reichel, to strike a series of medals based on a set of portraits by Marcello Bacciarelli painted some twenty years earlier. 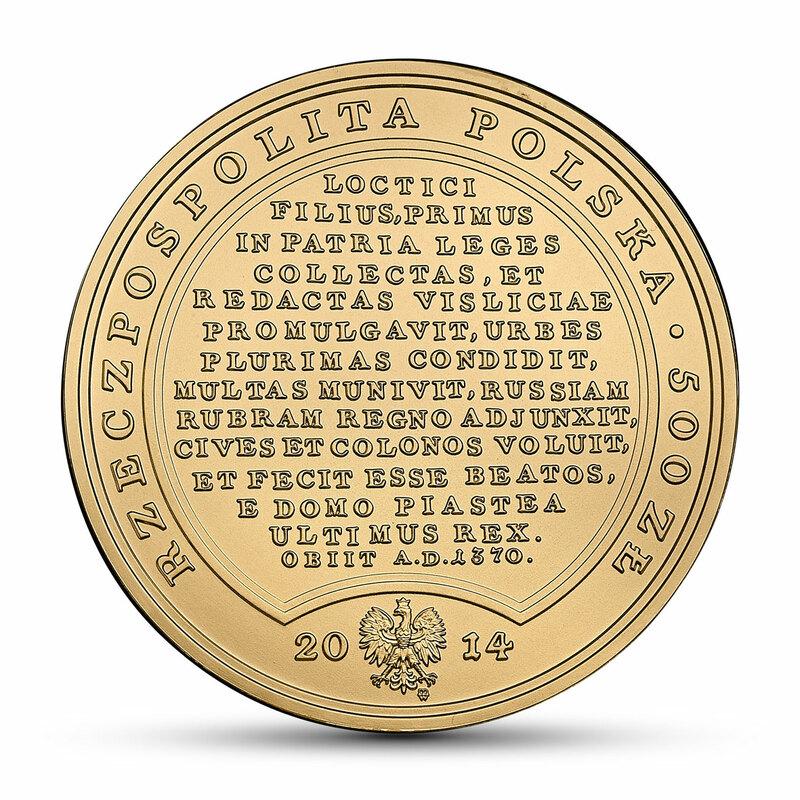 The result was issued by the Warsaw mint between 1791 and 1798. 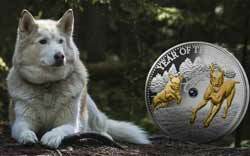 The NBP are releasing this series of twenty four coin replicas, accurate even down to the diameter and depth of relief. 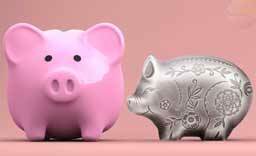 Originally planned to be released at a rate of four per year for six years, the first three years from 2013 to 2015 saw three coins per year, and recent changes to the 2016 release schedule may indicate that further contracting to just two. When the series will finish is now open to speculation. 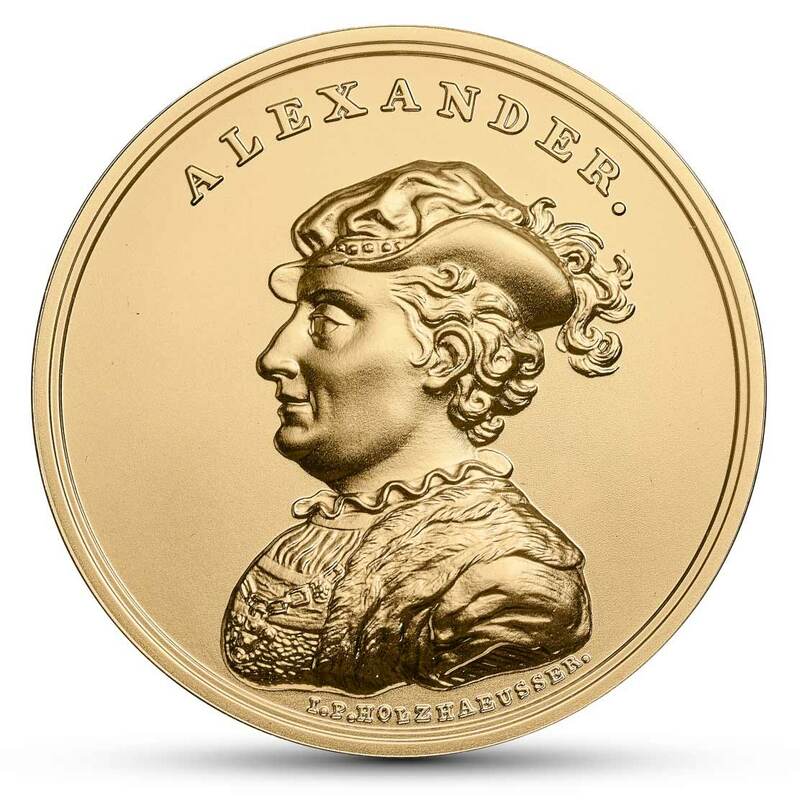 Each coin is a chunky 2oz in weight, a nice size for a commemorative we think, but that also applies to the gold version, and 2oz of gold doesn’t come cheap. 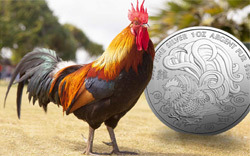 Most of you will be looking at the silver version and a recent mintage increase from 5,000 to 5,250 indicates things are healthy there, and with good reason. 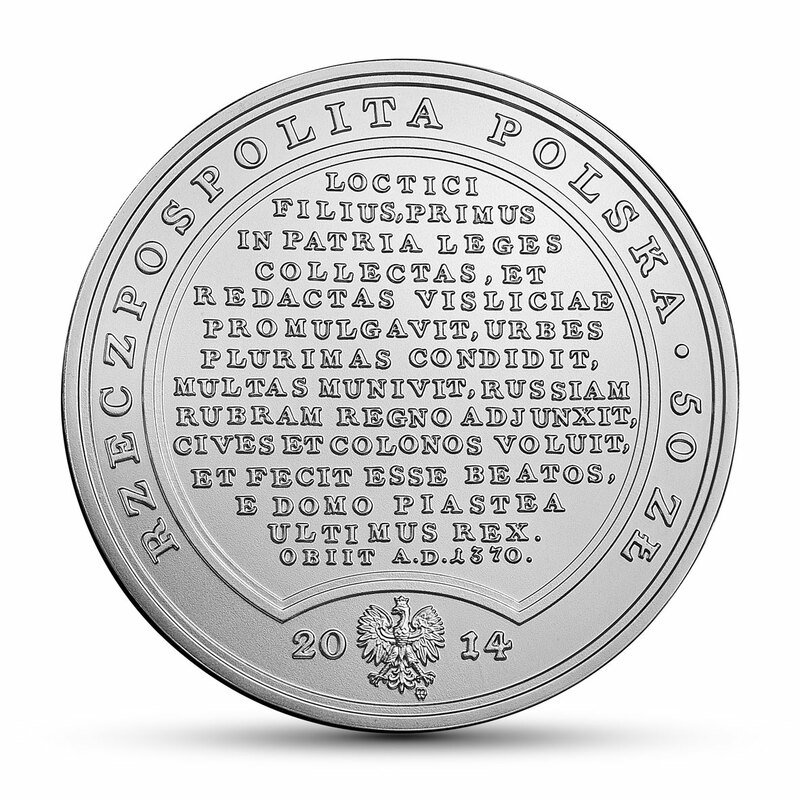 These are beautiful coins, expertly struck by the Mint of Poland (Mennica Polska) and quite superbly realised. Considering these are very close replicas of medals over 200 years old, it’s obvious the two medallists responsible for those genuinely were talented. 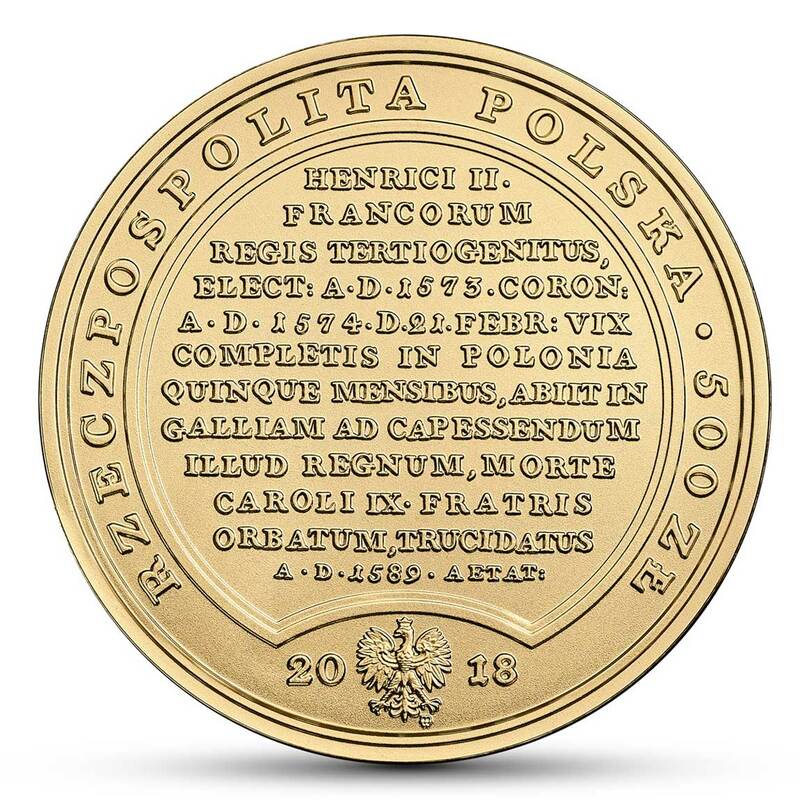 The reverse design includes one of the kings of Poland that ruled from 992 up until Stanislaw himself in 1795, although there is a big gap between 1025 and 1300 as apparently, medieval kings from the Piast Dynasty weren’t particularly well thought of in the late 18th century. The designs are of the highest order. The obverse sides carry an inscription with some notes on the life of the particular monarch. Each coin comes nicely boxed, it’s good seeing the silver presented to the same standard as the gold, and the whole completed set will be quite an impressive sight we believe. 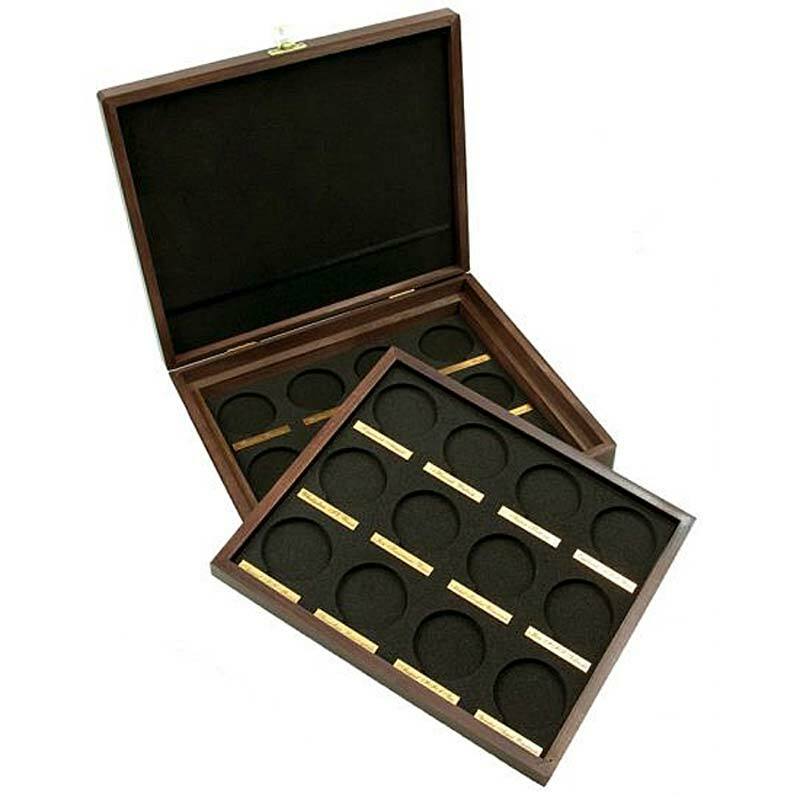 Some effort expended on a quality coin collection case would certainly be worthwhile for people having spent so much on the set. As we said, the release schedule moving forward isn’t known, and the set could take longer to get together than originally envisaged, but fans of history will certainly be advised to check this little known series out. 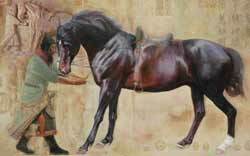 Due to the absence of the original, the portrait of Bolesław Chrobry is a work of imagination. It shows the monarch wearing a crown from a later period. 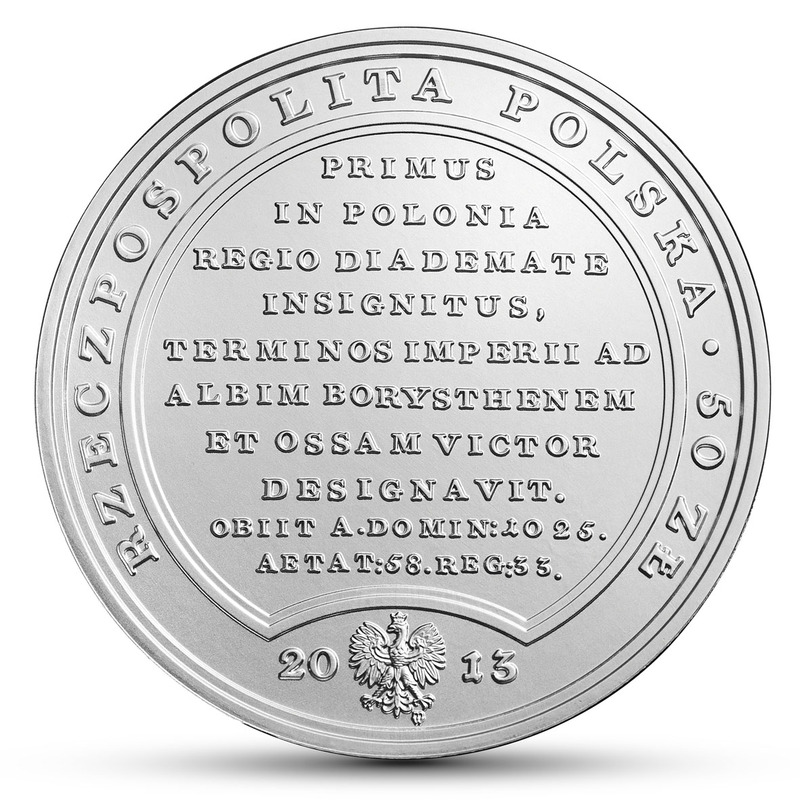 The inscription on the first medal in the series, on which the coin with Bolesław Chrobry has been modelled, reads as follows: “The first in Poland to be decorated with a royal crown, he, as the victor, delimited the borders of the state on the Elba, the Dnieper and the Ossa. Died in 1025 Anno Domini, aged 58, in the 33rd year of reign, on the 3rd day of April”. This first king of Poland of the Piast dynasty, the son of Duke Mieszko I and Bohemian princess Dobrawa, born around 967 and crowned in 1025, created a powerful state, having conquered territories in the east (Red Ruthenia, temporarily Kiev) and west (Meissen, Upper Lusatia and Lower Lusatia). He elevated Poland into the European policy elite; at the Congress of Gniezno in 1000 Emperor Otto III presented him with the symbol of power, i.e. the lance of Saint Maurice, and placed his imperial crown on Bolesław‘s head as a pledge of coronation. 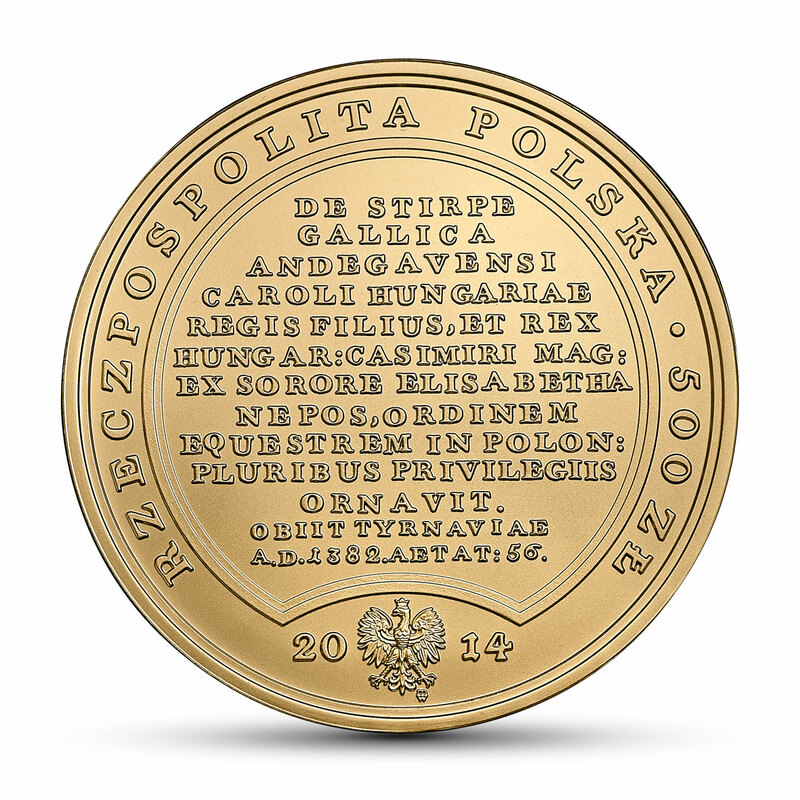 The canonisation of Saint Adalbert in 999 enabled Bolesław to establish the organisation of the Polish church with an archbishopric in Gniezno and bishoprics in Kraków, Kołobrzeg and Wrocław. He waged wars against Bohemia and border German marches with changing fortunes. 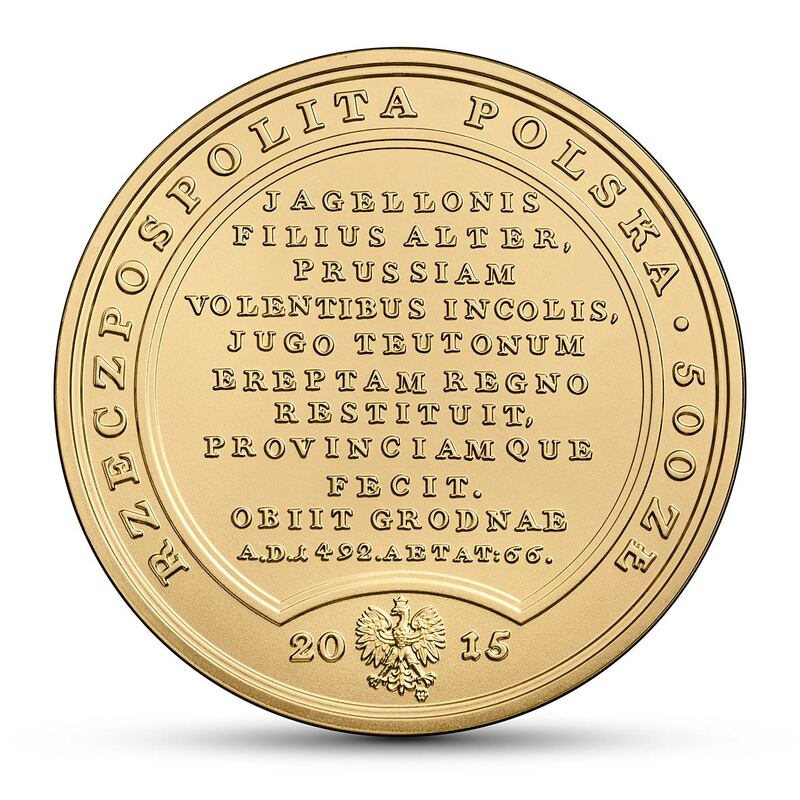 He started minting coins in his name with the name of Poland. 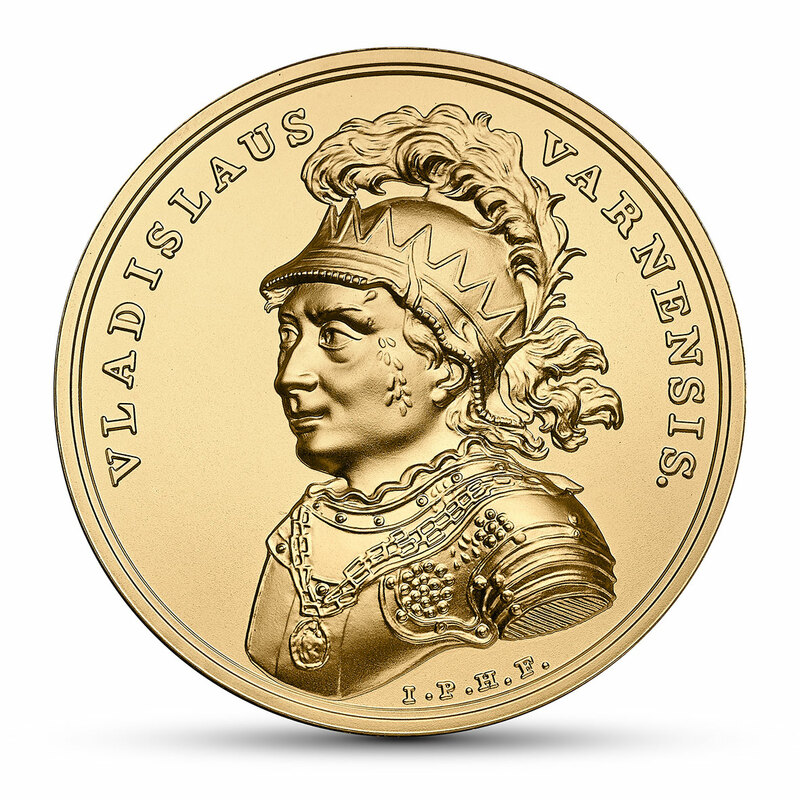 The second medal in the series, on which the coins have been modelled, depicts King Wacław II Czeski (Vaclav II). 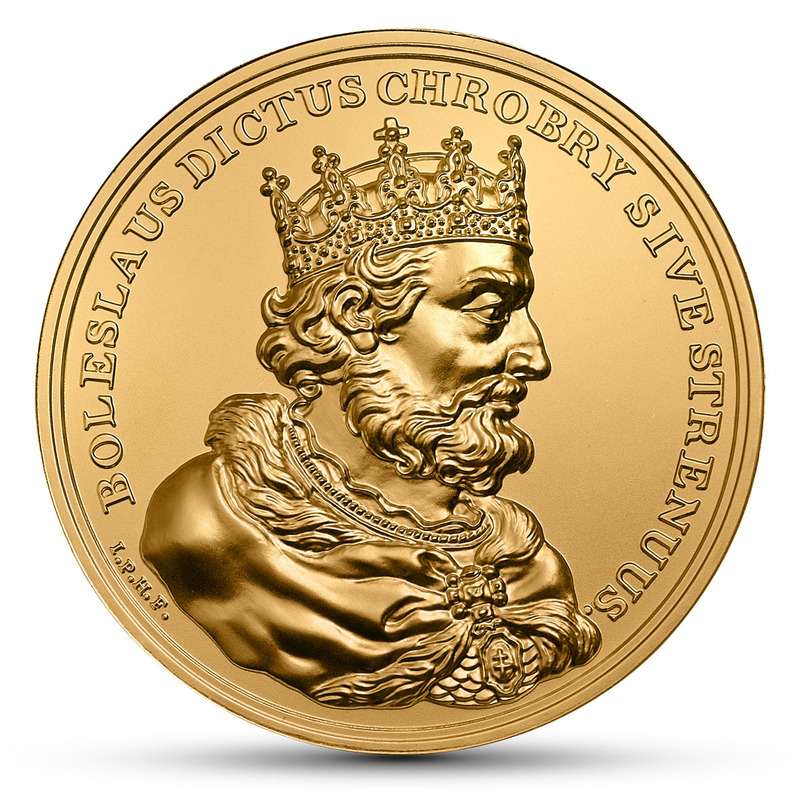 The series of medals, in similarity to the series of paintings by Marcello Bacciarelli from the 18th century, does not portray several crowned kings of Poland from the Piast dynasty who ruled after Bolesław I Chrobry. The Age of Enlightenment did not value Mediaeval history. Wacław II Czeski is shown from the profile, in a crown on a soft hat, in an ermine robe, with an ornate chain on his neck. On the reverse, there is the following inscription (here in translation): Son of Bohemian king Přemysl Ottokar III, son-in-law of Přemysl I [II] king of Poland, he died in Prague Anno Domini 1305, after five years of ruling Poland, at the age of 33, on 24 June. Wacław II Czeski from the Bohemian dynasty of Přemyslids was born in 1271; he became the king of Bohemia in 1283. Taking active part in the political power struggles of Polish parties related to the succession of the Duchy of Krakow following the death of Leszek the Black, he managed to take control of Lesser Poland and accepted the title of Duke of Krakow and Sandomierz in 1291. Next, he was paid homage by the following duchies: Duchy of Bytom, Duchy of Cieszyn, Duchy of Opole, Duchy of Racibórz, and later the Duchy of Legnica and Wrocław. He also took control of Greater Poland and Gdańsk Pomerania, thus winning over Władysław Łokietek (Ladislaus the Elbow-high) in his aspirations to win the crown. In 1300, archbishop Jakub Świnka crowned him the king of Poland in Gniezno. He married Elizabeth Richeza, daughter of King Přemysl II, thus consolidating his power as the king. He introduced a monetary reform in Bohemia by minting Prague groschen, which have become the universal tender in Central and Eastern Europe for two and a half centuries. 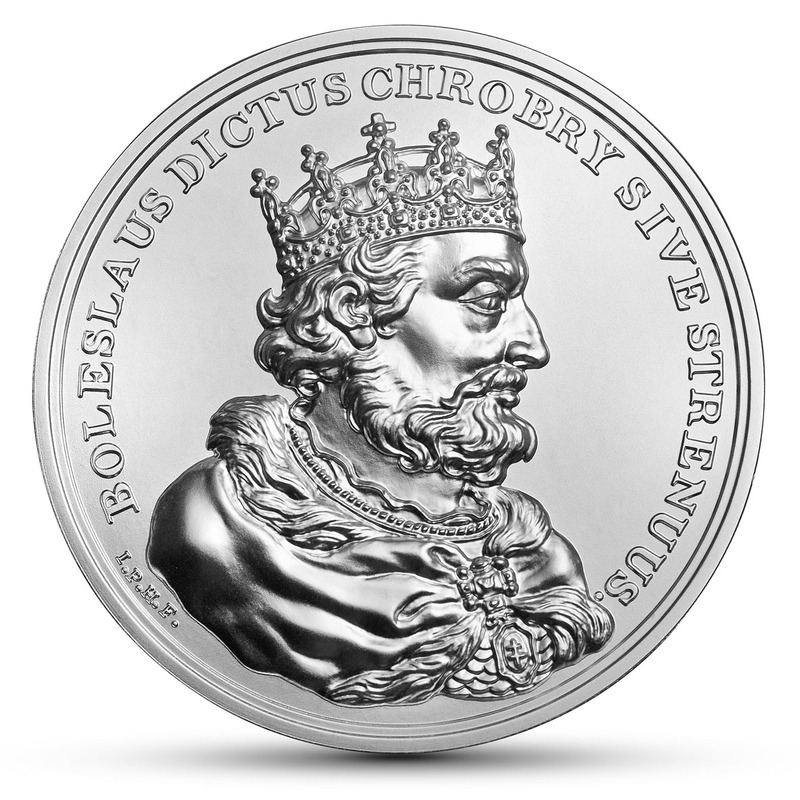 The third coin in the series is a medal depicting King Władysław Łokietek (Ladislas the Elbow-high or Ladislas the Short), who restored the Piast dynasty to the throne after a short rule of two kings by the name of Vaclav from the Czech Premyslid line. Władysław Łokietek’s greatest merit was to unify vast areas of the Kingdom of Poland after the period of regional disintegration. 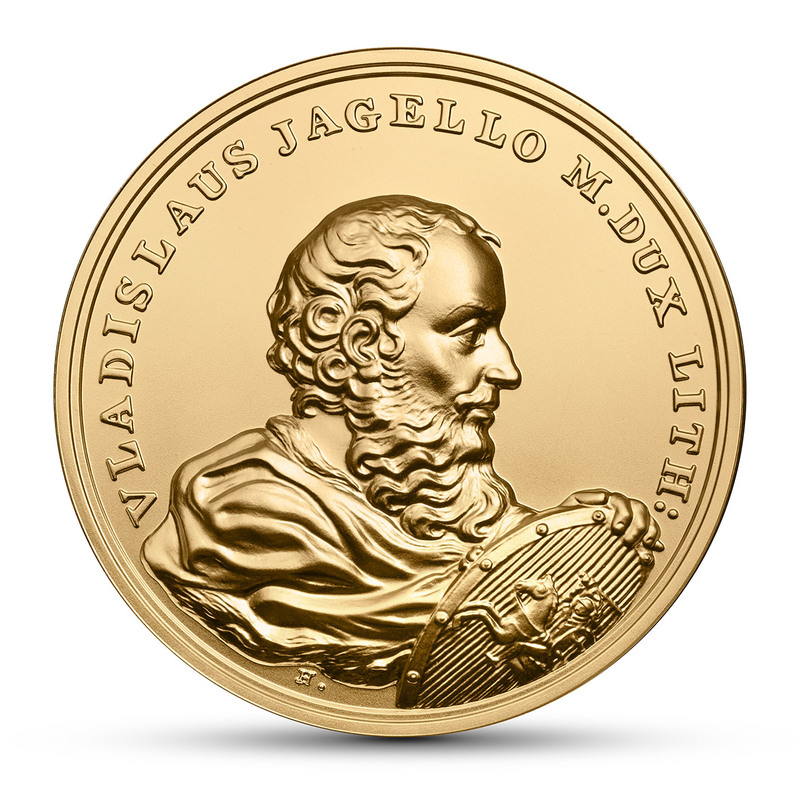 The portrait by Marcello Bacciarelli, which served as the model for the medal by Jan Filip Holzhaeusser, shows the king’s bust. His features were most likely modelled on his tomb in the Wawel cathedral. The king is wearing a helmet with chain mail and a tassel as well as rich Reiter armour (although it was anachronous as it was used only in the 17th century). The medal’s reverse reads (in translation): The son of Casmir, duke of Kuyavia, three times banished; when he returned to his motherland he united and merged the dispersed parts of the state. He died A.D. 1333, aged 73, having ruled for 13 years, on 2 March. Władysław Łokietek, from the Kuyavian line of Piasts, was born in 1260 or 1261. Initially he was the duke of Brześć in Kuyavia. He enlarged his domain fighting tirelessly with regional dukes, although with varying results. He won, lost and recovered the Duchies of Łęczyca, Sieradz, Sandomierz, Greater Poland and Eastern Pomerania. In 1306, after four-year banishment and the deaths of kings Wacław II (Vaclav II) and Wacław III (Vaclav III), he finally took control of Lesser Poland, and in 1314 of Greater Poland. Despite the victory in the battle of Płowce, he lost Gdańsk Pomerania and later Kuyavia to Teutonic Knights. Western Pomerania, Silesia, Masovia and Czerwień Towns also remained outside of his territory. With the consent of the Pope, he was crowned on 20 January 1320 – not in Gniezno, but in the Krakow Wawel cathedral as the first Polish king crowned there. He struck the first Polish golden coin – the famous florin. Only one such coin has survived until present. 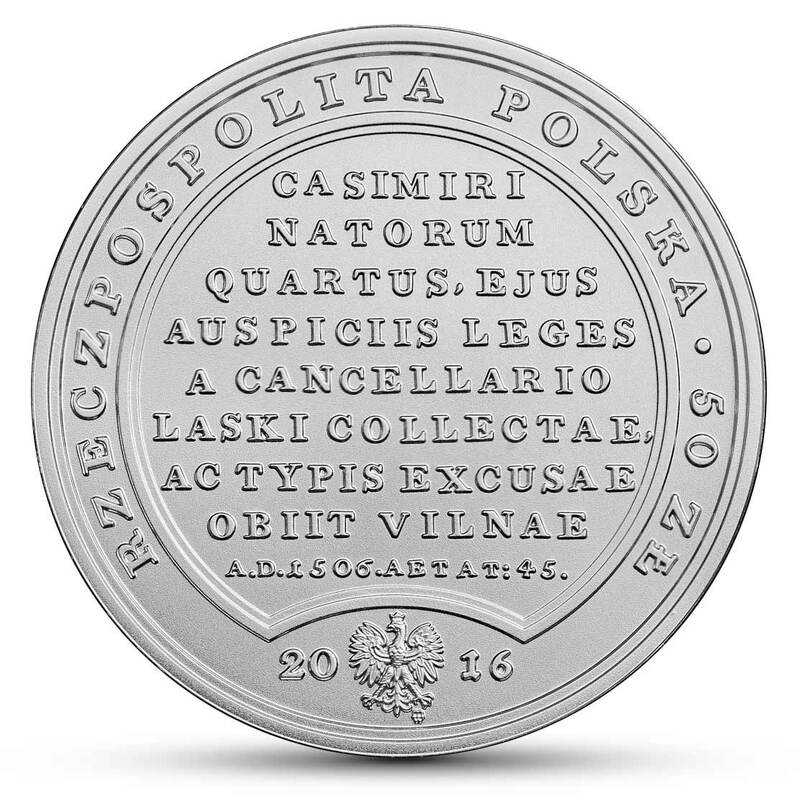 The fourth coin in the series is a medal depicting the son of Władysław Łokietek (Ladislas the Elbow-high or Ladislas the Short) – Casimir, who gained the title of “Great” due to his enormous contribution to the restoration of the Piast monarchy, although he became the last ruler of this first Polish dynasty. 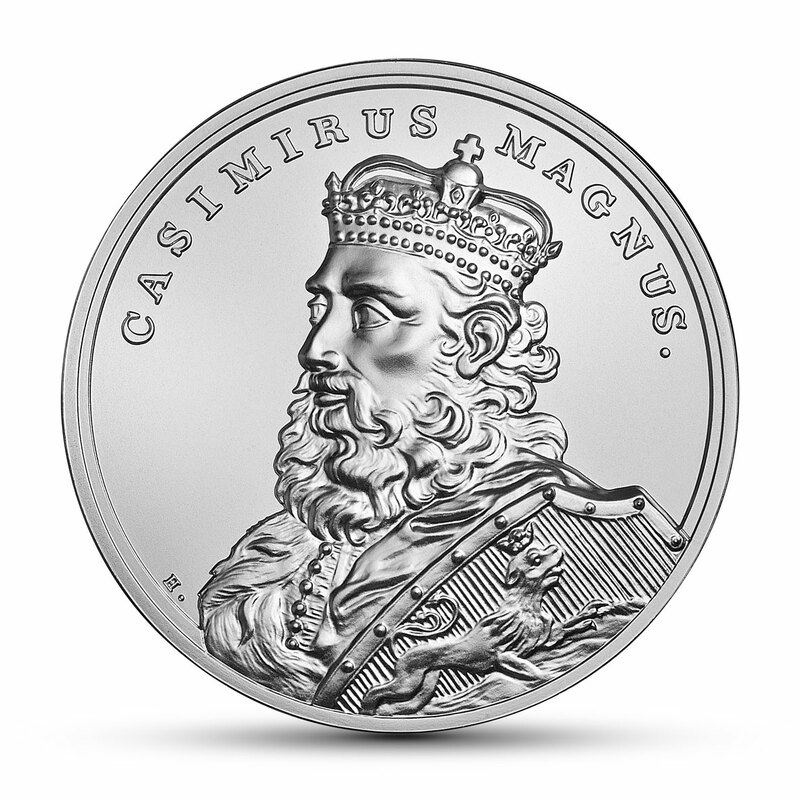 The image of the king on the medal is a natural reference to the portrait by Marcello Bacciarelli (a different crown and garments, a prominently displayed shield with a crowned lion, showing – in a mirror reflection – the coat of arms of the annexed Red Ruthenia). 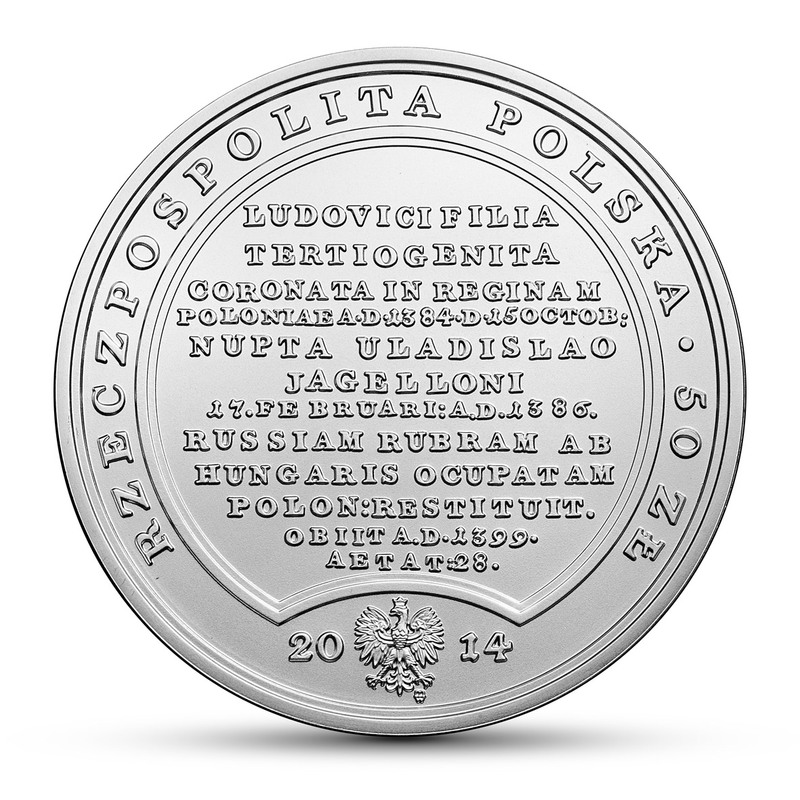 In translation the reverse of the medal reads (on the coin the original text is slightly shortened): The Son of Łokietek, the first who collected the native rights and announced them in Wiślica, fortified many towns, incorporated Red Ruthenia into the Crown, desired to make and made citizens and farmers happy; the last king of the House of Piast. Died on the 5th of November 1370, at the age of 60, having ruled for 33 years. 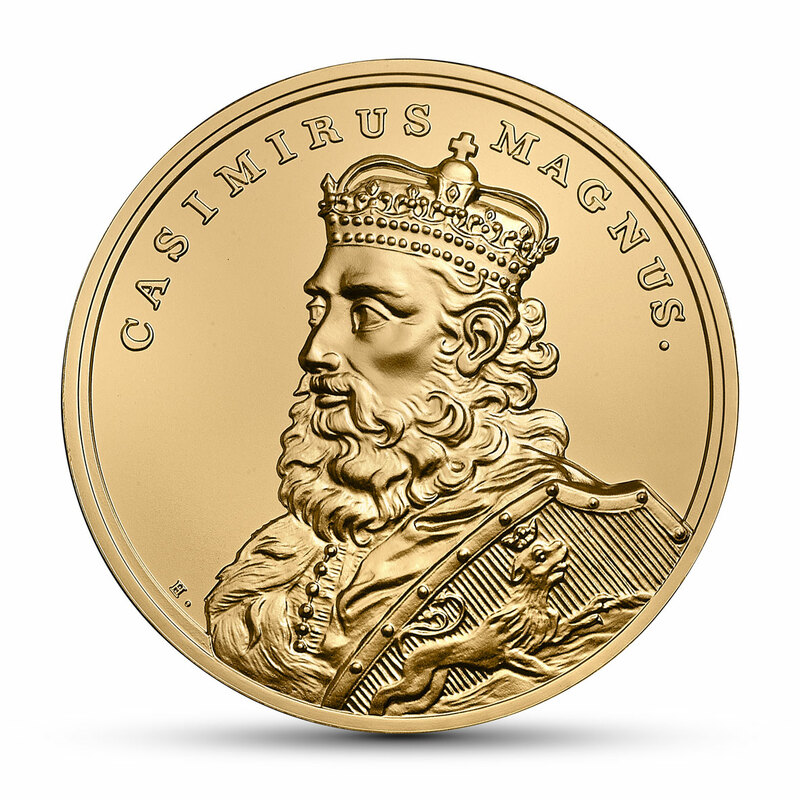 The long reign of Casimir the Great, born in 1310, yielded many benefits to the country. The King reinforced power in the hereditary districts – Greater Poland, Sieradz and Wieluń Land, Lesser Poland and Kuyavia. Losing Gdańsk Pomerania to the Teutonic Knights, and in 1348 – the Silesian principalities to Bohemia, he directed his expansion towards the east and south. He annexed the Principality of Galicia–Volhynia (Red Ruthenia) and subordinated Mazovia and Podolia. The trade route connecting the Baltic Sea with the Black Sea was established. The economy boomed, supported by modernisation measures – the unification of law, settlement of towns, as well as treasury and military reforms. The country gained dozens of new castles and many secular and church buildings. 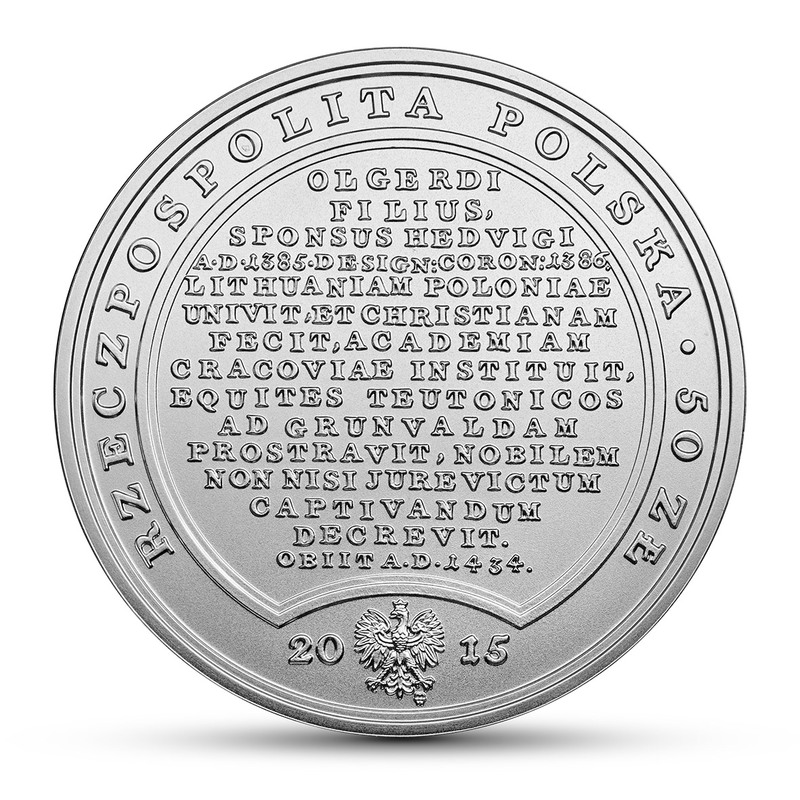 In 1364 the king founded Kraków Academy, the first Polish university. 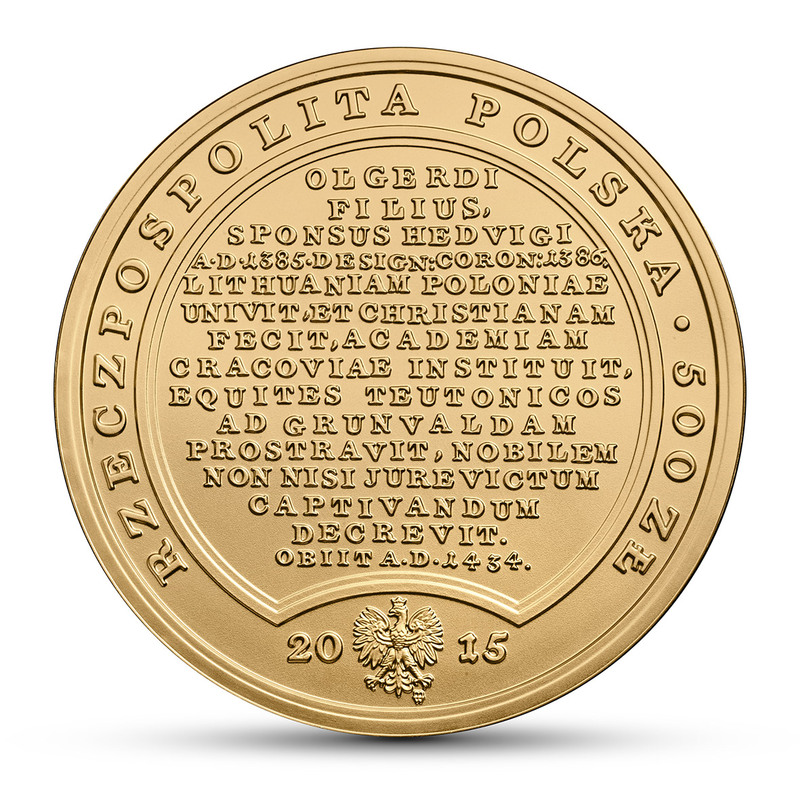 He carried out a monetary reform, creating new monetary units, including the first thicker silver coin – the Kraków grosz. The fifth coin of the series commemorates Louis I from the French Angevin dynasty (d’Anjou), son of Charles Robert and Elizabeth of Poland. Louis was King of Hungary from 1342, and in 1370 – under previously made arrangements regarding the succession of the Angevins to the Polish throne in the event there were no male descendants of Casimir the Great – he became King of Poland. The medallic image of Louis, bearing resemblance to the portrait by Marcello Bacciarelli, shows the right profile of the king, with a beard, wearing a robe with rosettes and a buckled coat. He has an ornamental crown on his head, different than the one in the portrait. 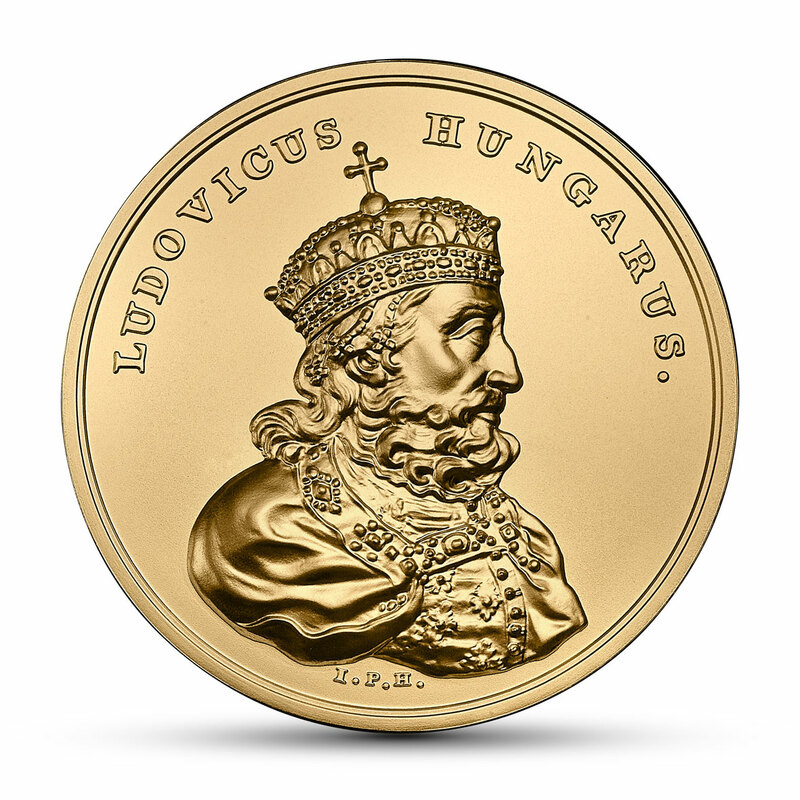 The medal’s reverse reads in translation (on the coin’s obverse in an abbreviated version): From a French house, son of Charles of Anjou, King of Hungary, and King of Hungary himself nephew of Casimir the Great from his sister Elizabeth’s side, he gave many privileges to the nobility. He died in Trnava A.D. 1382, aged 56, having reigned Poland for 12 years, on 12 September. Louis, born in 1326 in Visegrád, became King of Poland after 28 years of successful reign in Hungary (where he was nicknamed the Great). In Poland, after his coronation in Cracow on 17 November 1370, it was his mother, Elizabeth of Poland, and later bishop Zawisza Kurozwęcki, who reigned in his stead during Louis’ frequent absences; a prominent role was also played by Duke Vladislaus II of Opole. In order to obtain permission for his daughters to succeed to the throne, Louis granted the Polish szlachta (gentry) the Privilege of Koszyce in 1374, which included tax exemptions and other liberties. This way he weakened the royal authority but laid a cornerstone for the later nobles’ democracy. He waived claims on Silesia in favour of Bohemia and gave Red Ruthenia to the Hungarian crown. He fought victorious battles for Hungary in the Balkans and towards the end of his life conquered Dalmatia and Dubrovnik. He died in Nagyszombat (in Latin Tyrnavia, currently Trnava in Slovakia) in 1382. 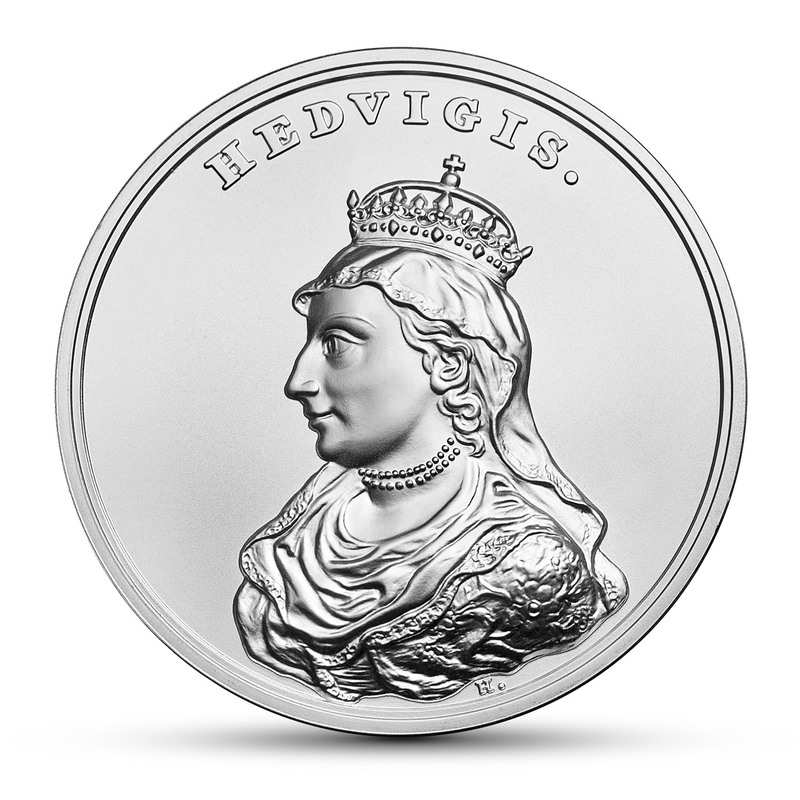 The sixth coin of the series commemorates Jadwiga of Anjou, daughter of Louis I of Hungary, who was crowned Queen of Poland in 1384. In 1386, Jadwiga was married to Ladislas Jagiello, Grand Duke of Lithuania. Despite her young age, thanks to her strong international position and wise politics, she gained prestige and respect. Known also for her piety and charity, publicly venerated, Jadwiga was canonized by the Roman Catholic Church in 1997. The medallic image of Jadwiga, referring to her portrait by Marcello Bacciarelli, shows her left profile, with a veil and an ornamental crown on her head, a folded dress and a double strand pearl necklace. 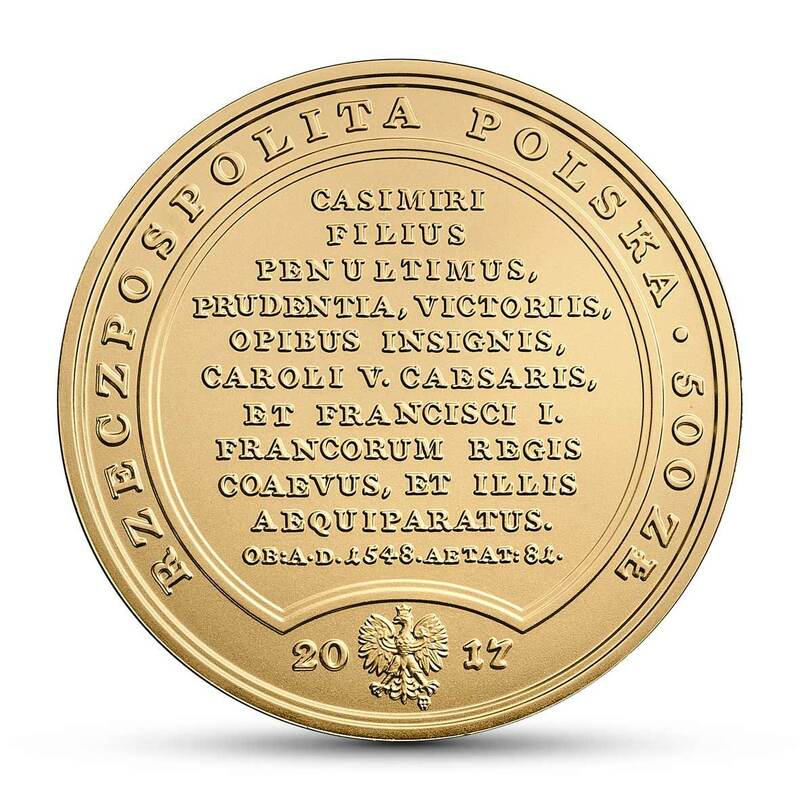 The medal’s reverse reads in translation (on the coin’s obverse in an abbraviated version): The third daughter of Louis,crowned Queen of Poland A.D. 1384, on 15 October. Married to Ladislas Jagiello on 17 February A.D. 1386. She restored to Poland Red Ruthenia from Hungary’s occupation. Died A.D. 1399, aged 28, on 17 July. Born in 1373 or 1374, Jadwiga succeeded to the throne of Poland at the age of ten; she ruled on her own for two years, then thirteen years together with Ladislas Jagiello. Well educated, she actively participated in politics and diplomatic mediations with Dukes of Lithuania Vytautas and Skirgaila as well as with the Teutonic Order. In 1387 she recovered to Poland Red Ruthenia, which had been incorporated into Hungary by Louis I of Hungary after the death of Casimir the Great. She contributed to the restoration of the Cracow Academy – she left her dresses and jewels to the Academy in her last will. She performed a wide variety of funding and charitable activities, she encouraged translations of Latin sacral texts into Polish. She died after giving birth to her daughter Elizabeth Bonifacia, who also died in 1399. 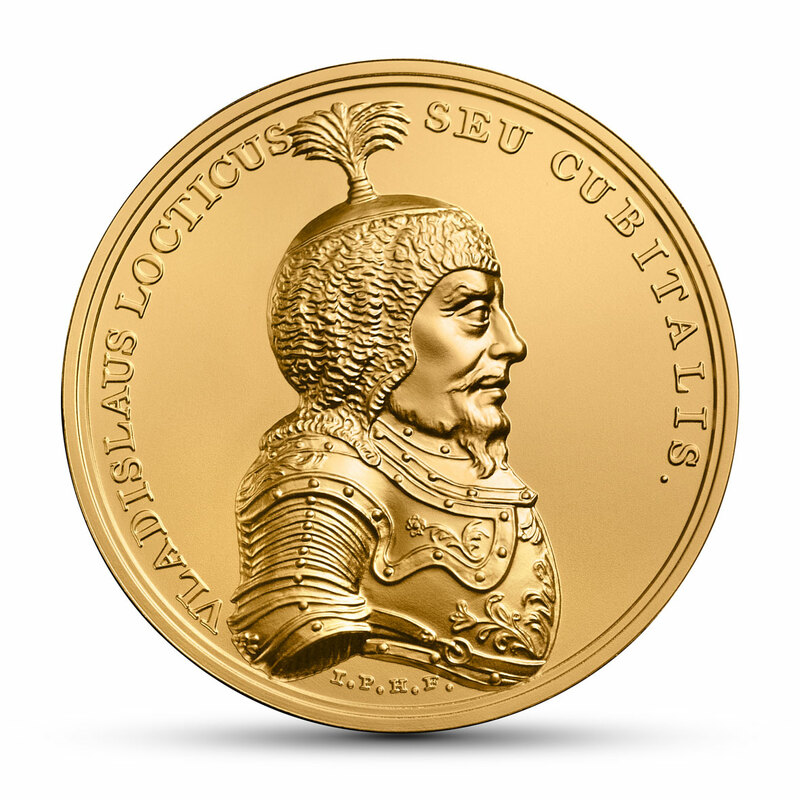 The seventh coin of the series shows Jagiello, the ruler of Lithuania from 1377. He was crowned King of Poland in 1386, following his baptism, his marriage to Poland’s Queen Jadwiga of Anjou and the adoption of the name of Władysław (Ladislas). Fulfillment of these commitments resulted in the formation of the personal union between Poland and Lithuania and initiated the Christianization of Lithuania. Thus Ladislas became the founder of the Jagiellonian dynasty, which ruled a significant part of Europe. 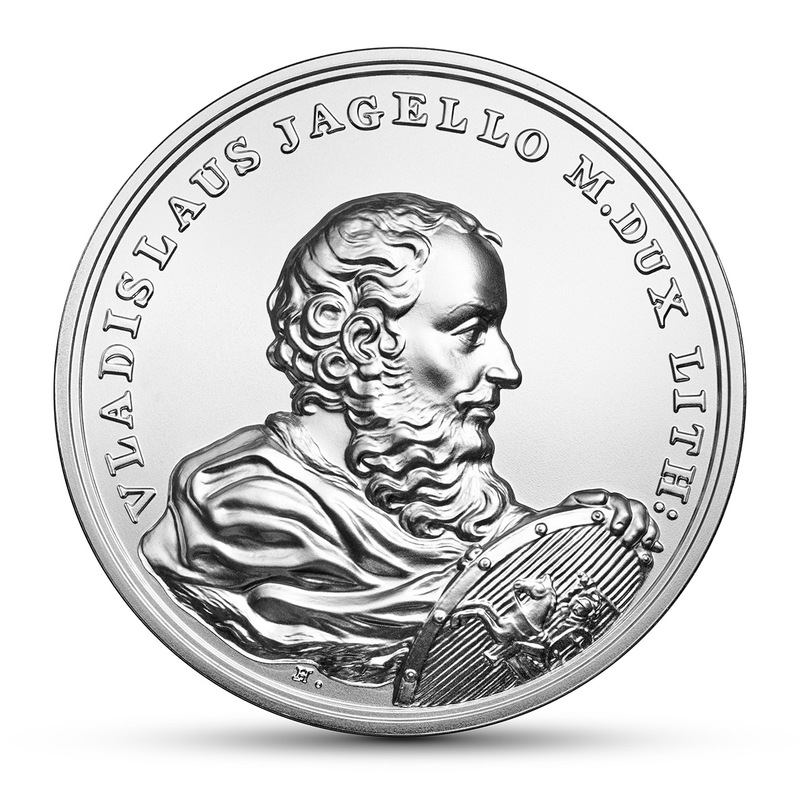 Medallic image of Ladislas, though imitating a portrait by Marcello Bacciarelli, is wrong because the painter had wrongly chosen the portrait of Sigismund-Augustus as a model. 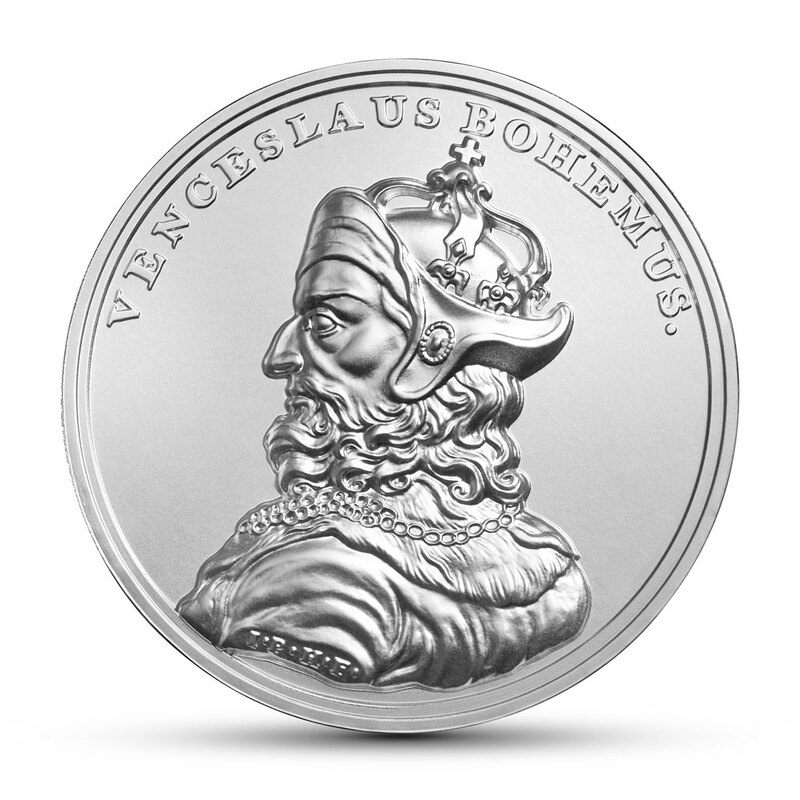 On the medal, the sovereign is shown in the right profile, bareheaded, with abundant beard and a coat draped around his shoulders. His left hand rests on a shield featuring the Lithuanian coat of arms, Vytis (the Chaser). 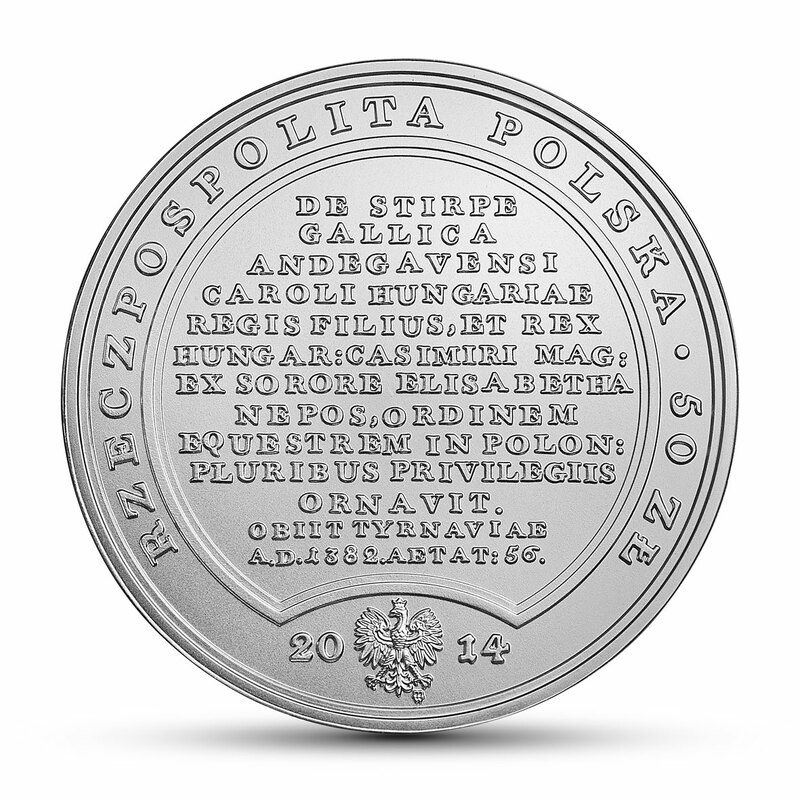 The medal’s reverse reads in translation (on the coin’s obverse the text is in an abbreviated version): Algirdas’ son, designated Jadwiga’s spouse A.D. 1385, crowned in 1386. He joined Lithuania and Poland together, made Lithuania Christian, founded the Academy in Cracow, defeated Teutonic Knights at Grunwald, and decided that no nobleman could be held in custody without a court ruling. He died A.D. 1434, at the age of 86, in the 48th year of his reign, on 31 May. Ladislas was born under the name of Jogaila. His date of birth is still unknown (between 1351 and 1362) and subject to debate. He was the son of Algirdas, Grand Duke of Lithuania from Gediminid dynasty. Looking for allies to fight the Teutonic Knights, Jagiello turned to Poland. Under the Treaty of Krevo, in exchange for the Polish throne, he undertook to convert Lithuania into Christianity and to establish a union with Poland. 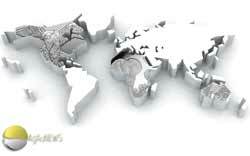 The union benefited both countries politically, economically and culturally. He halted the expansion of the Teutonic Order and won the famous victory at Grunwald (1410). He joined a part of Spisz to Poland, restored Dobrzyń Land to Poland and Samogitia – to Lithuania. He received homage from Moldova and entered into an alliance with Brandenburg. To maintain the Dynasty he gave the nobles numerous priviledges, including famous act neminem captivabimus nisi iure victum (we shall imprison noone except if he has been lawfully sentenced). In 1400, he restored – thanks to Jadwiga’s donation – the Academy in Cracow, which was later named the Jagiellonian University. 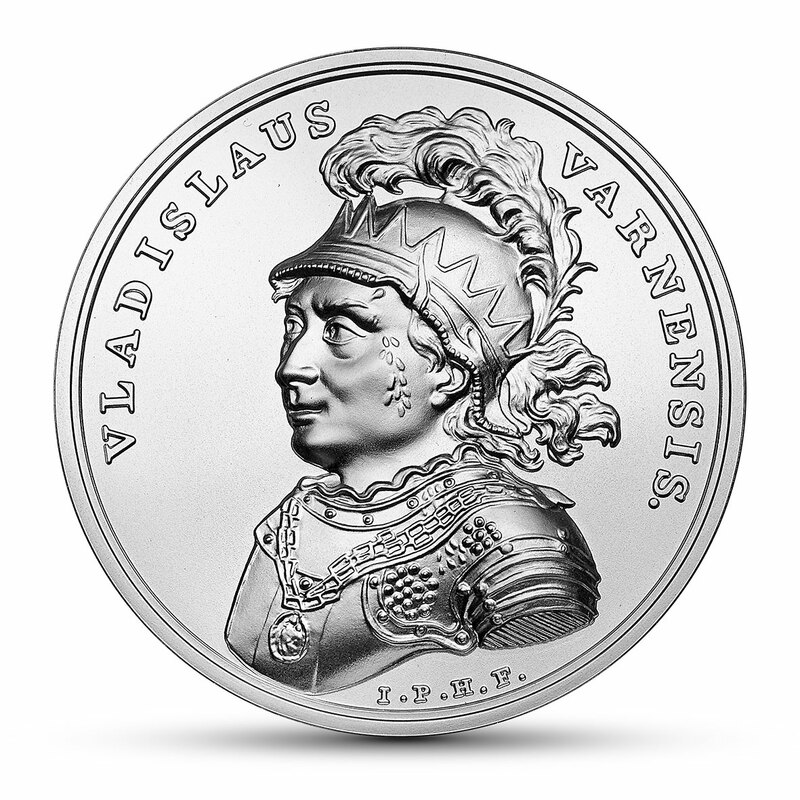 The eighth coin in the series depicts Ladislas of Varna, son of Ladislas Jagiello, crowned in 1434 as King of Poland, titular Grand Duke of Lithuania, and in 1440 as King of Hungary. In 1435 he received the homage of the Voivode of Moldavia and signed the Peace of Brześć Kujawski with the Teutonic Knights. His short reign was divided between Poland and Hungary. 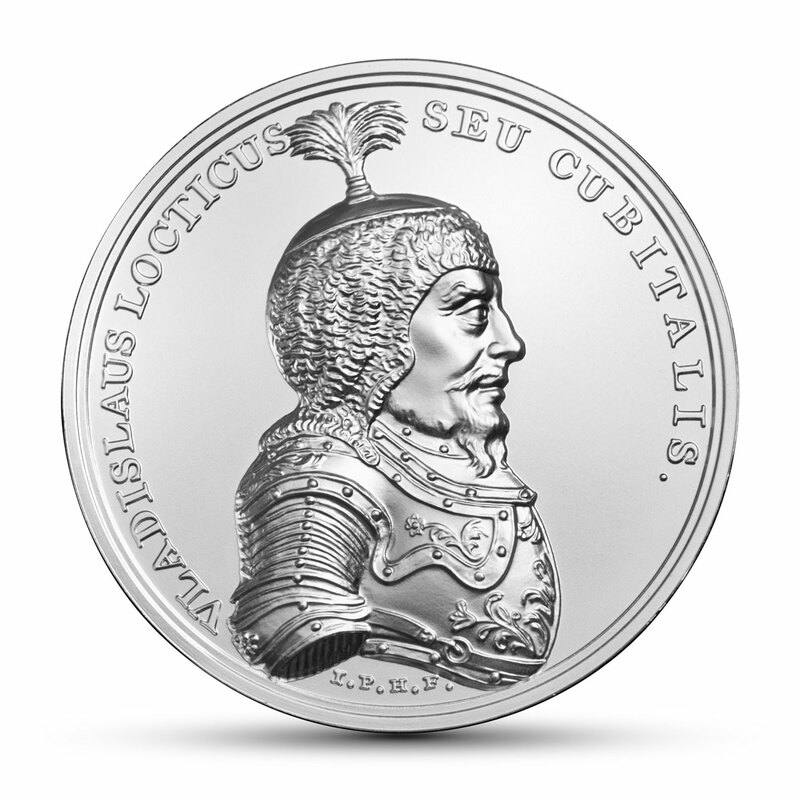 The medal image of the king, based on a portrait painted by Marcello Bacciarelli, depicts the bust of an armoured man facing left. There is a wound on his temple, with blood running from under his broken helmet. A crown is placed on his helmet and there is a medallion of the Virgin Mary with Child hanging on his breast – on a decorative, 17th century-style armour. 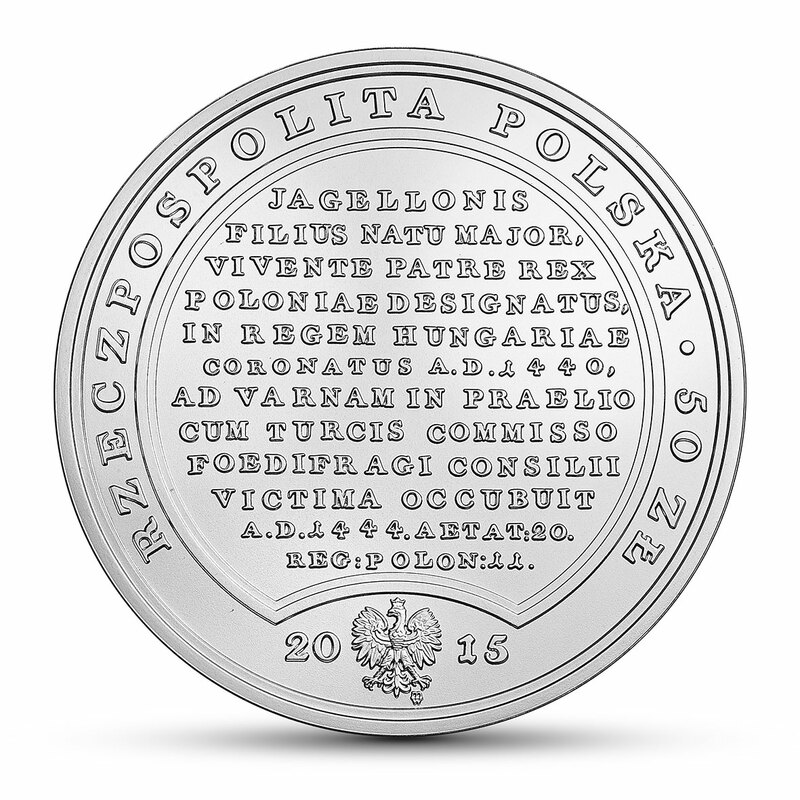 On the reverse of the medal (on the averse of the coin the text is slightly shorter) it reads: Jagiello’s oldest son, intended as King of Poland during the life of his father, crowned as King of Hungary in the year of the Lord 1440. At the Battle of Varna against the Turks, he fell victim to treacherous advice and was killed in the year of the Lord 1444, at the age of 20, on the 10th of November in the eleventh year of his reign in Poland. Ladislas, the first-born son of Ladislas Jagiello and his fourth wife, Lithuanian princess Sophia of Halshany, was born in 1424. On behalf of the minor king, crowned at the age of 10, the regency was held by a royal council, above all, by the Bishop of Cracow, Zygmunt Oleśnicki, who paved Ladislas’s way to the Hungarian throne. Despite the signed truce, as the leader of the victorious European crusade against the Turks in the Balkans (1443–1444), Ladislas undertook another expedition to Adrianople and was killed in the Battle of Varna. 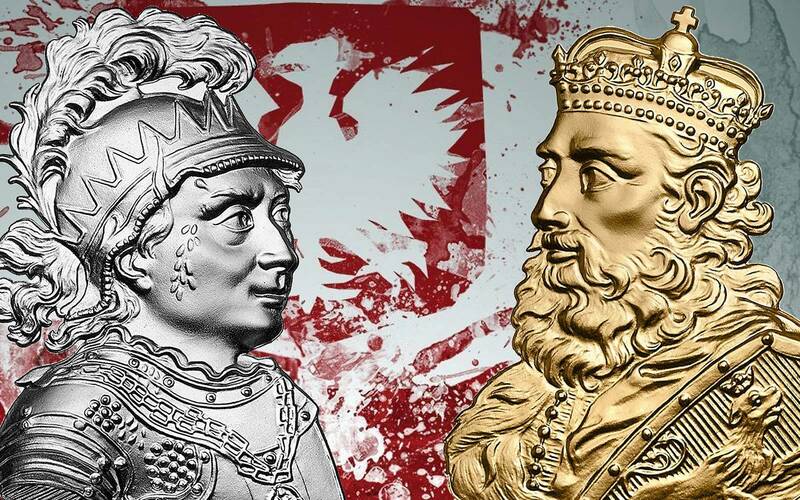 The king’s body was never recovered, the fact which underlay the legends about him surviving the battle and was the reason for a threeyear delay in acclaiming a new King of Poland. In 1906 a symbolic tombstone of Ladislas of Varna was erected in the Wawel Cathedral, and in 1935 a monument to him was built in Varna. 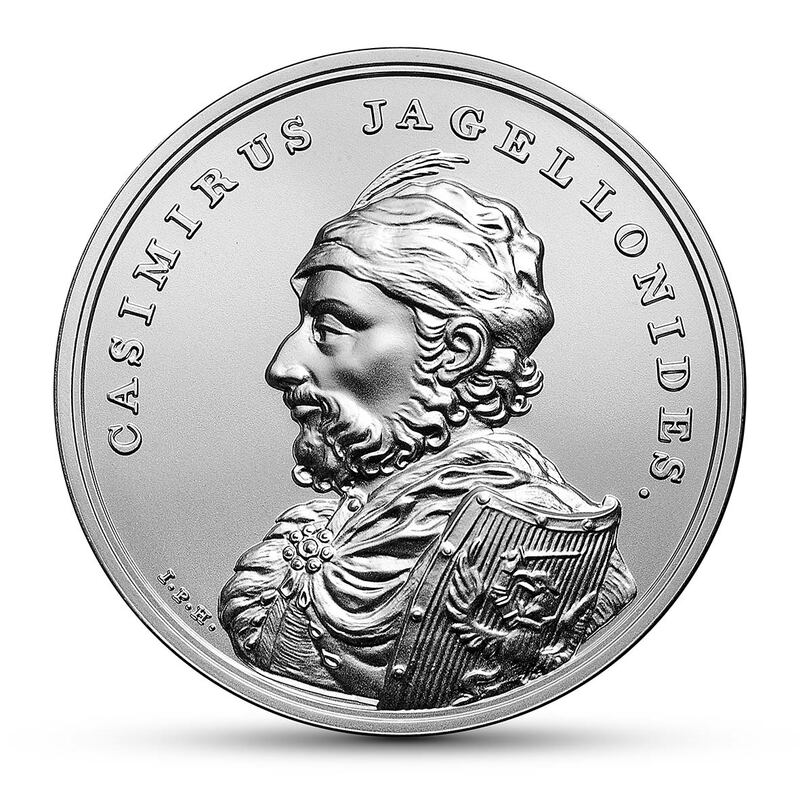 The ninth coin in the series depicts Casimir Jagiellon, the younger brother of Ladislas of Varna. His long reign was a very fruitful one as it saw the incorporation of Prussian territories, the Duchy of Oświęcim and a part of Mazovia into the Kingdom of Poland. Of the 13 children born of his marriage to Elisabeth of Austria (known as the mother of kings), four of his sons were crowned, one was granted the nimbus of a saint and five daughters married into renowned European ducal families. The Jagiellonian dynasty became a significant political power in 15th-century Europe. In the medallic bust of the king (modelled on a portait painted by Marcello Bacciarelli) the facial features bear resemblance to the tombstone sculpted by Wit Stwosz (Weit Stoss) in Wawel Cathedral. The medal features the king’s head covered with a fur cap decorated with a hat brush, and by the cloak fastened with a buckle there is a shield bearing the coat-of-arms of Royal Prussia. 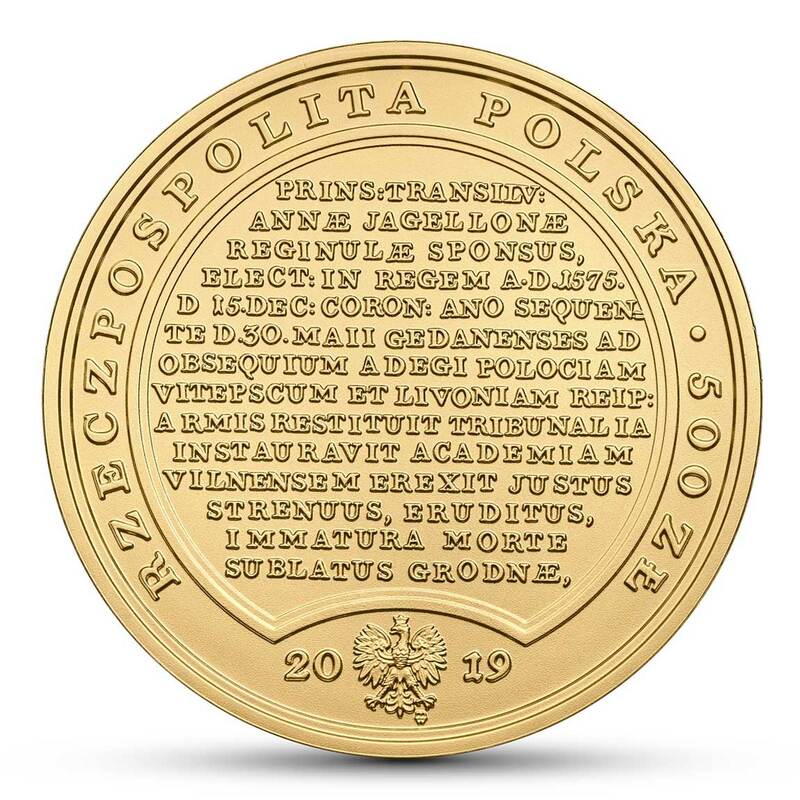 The inscription on the reverse of the medal reads (in translation): Jagiello’s second son, having, at the inhabitants’ request, liberated Prussia from the Teutonic yoke, returned it to the Crown and made it a province. He died in Grodno A.D.1492, at the age of 66, in the 45th year of his reign, on 7 June. Casimir, born in 1427, the son of Ladislas Jagiello and Zofia Holszańska, was proclaimed Grand Duke of Lithuania in 1440, but the personal Polish-Lithuanian union was formally renewed only after his coronation in 1447. The development of the Vistula-borne trade, the political emancipation of towns in the Teutonic state and the establishment of the Prussian Union all led to the issuing of the act of incorporation of Prussia into Poland in 1454. 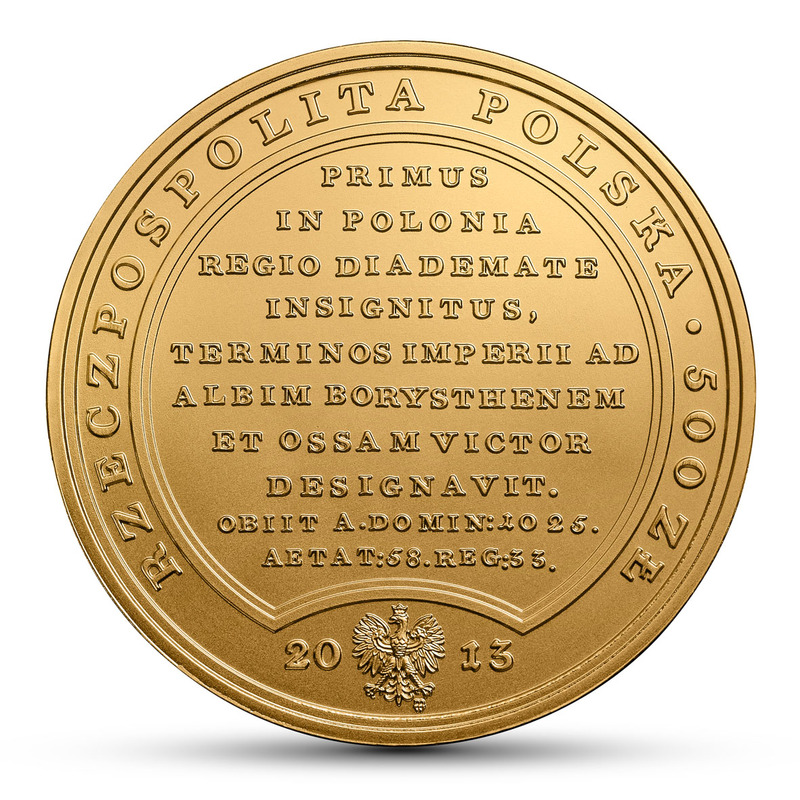 Following the Thirteen Years War with the Order of the Teutonic Knights that ended with Poland’s victory in 1466, Poland gained Gdańsk Pomerania (Pomerelia) and part of Prussian territories. The Order became a vassal to the Polish Crown. For his son, Ladislas, the king obtained the crowns of Hungary and Bohemia. 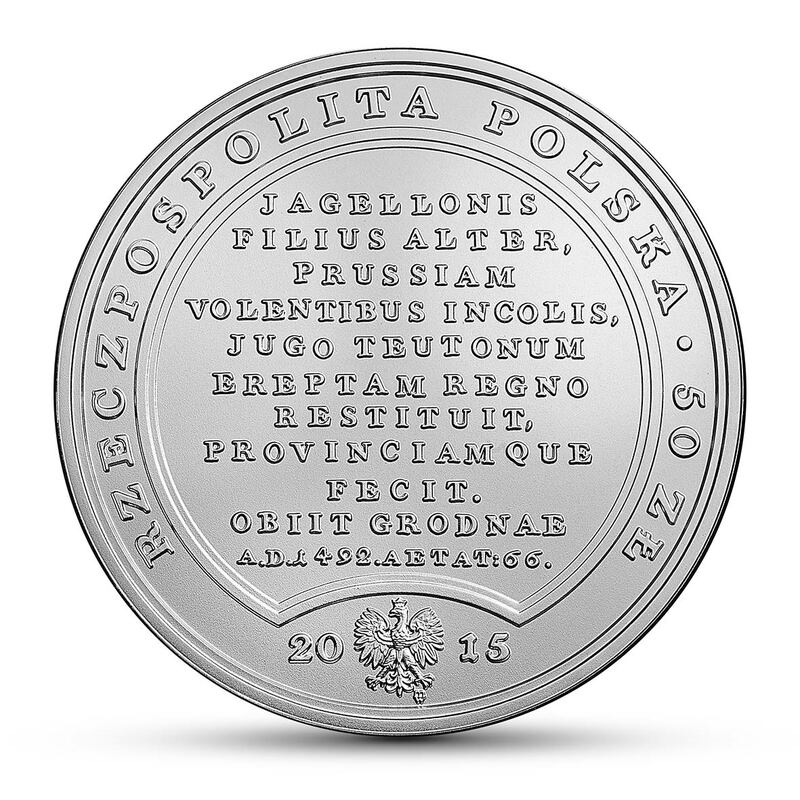 Polish nobles were awarded new privileges. Science and culture flourished; Jan Długosz wrote his monumental history of Poland and Wit Stwosz (Weit Stoss) created his altarpiece in St. Mary’s Basilica in Kraków. 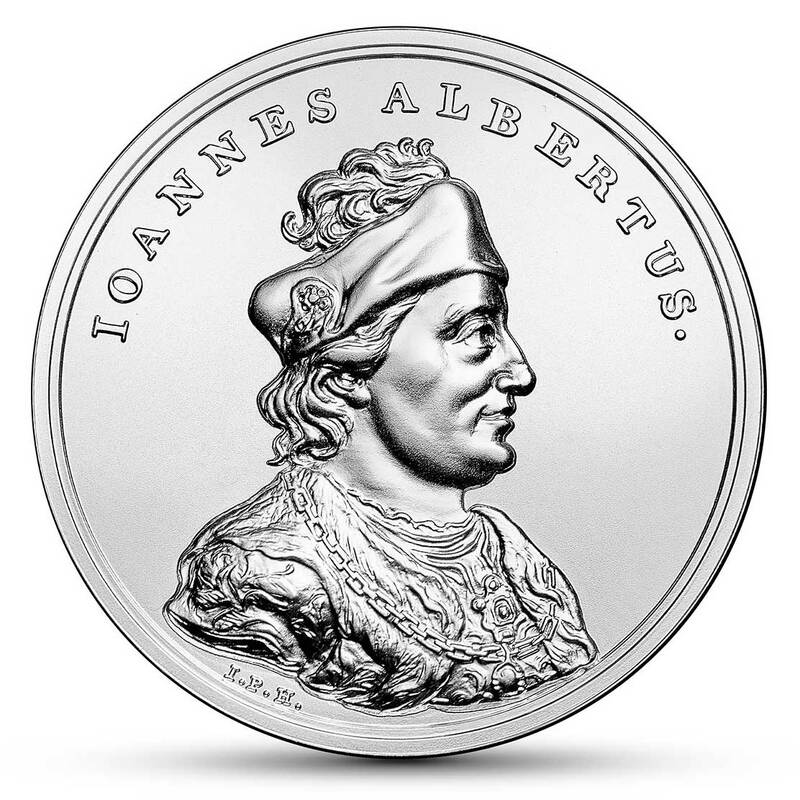 The tenth coin of the series portrays John Albert, the third son of Casimir Jagiellon, King of Poland from 1492, Duke of Głogów until 1498, ineffectively elected King of Hungary in 1490. His brief reign was difficult and tarnished by the defeat in Bukovina. During this period the Polish-Lithuanian personal union was suspended (the Grand Duke’s throne in Lithuania was taken over by his brother Alexander). The medallic bust of the king in profile turned to the right (modelled on a portrait by Marcello Bacciarelli) bears a resemblance to the facial features sculpted on the Gothic-Renaissance tomb in Wawel Cathedral. On the medal, the king is shown wearing a kalpack with an ostrich feather; over his coat he is wearing a gold chain with a medallion. 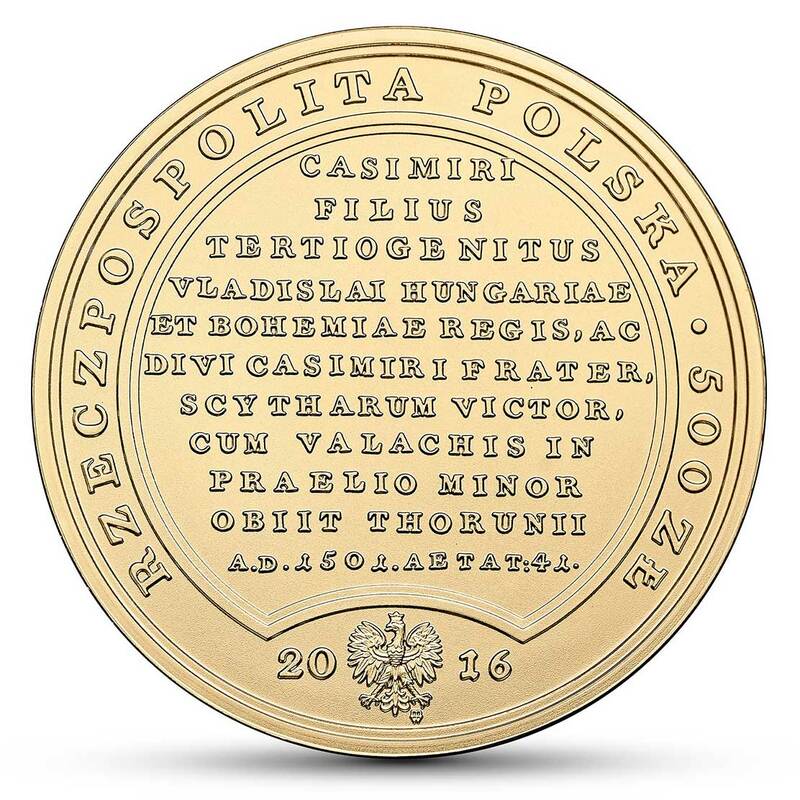 The obverse of the coin reads in translation (a slightly abbreviated text taken from the reverse of the medal): Casimir’s third son, brother of Ladislas, King of Hungary and Bohemia, and of Saint Casimir, who defeated the Tartars and was defeated in battle by the Wallachians. Died in Toruń A.D. 1501 at the age of 41, in the 9th year of his reign, on 7 August. John Albert, born in 1459, was the third son of Casimir Jagiellon and Elisabeth of Austria. He incorporated the Duchies of Zator and Płock into the Crown. In foreign policy he focused on fighting the Tartars and Turks, and on striving to regain Polish control over Moldova and Wallachia, Polish fiefs from 1387. The expedition of the levée en masse in 1497 ended in defeat in the battle of Koźmin in Bukovina, where approx. 5,000 Polish noblemen were killed (hence the saying, “In King Albert’s time the gentry died out”). The war was halted by the truce in 1501. 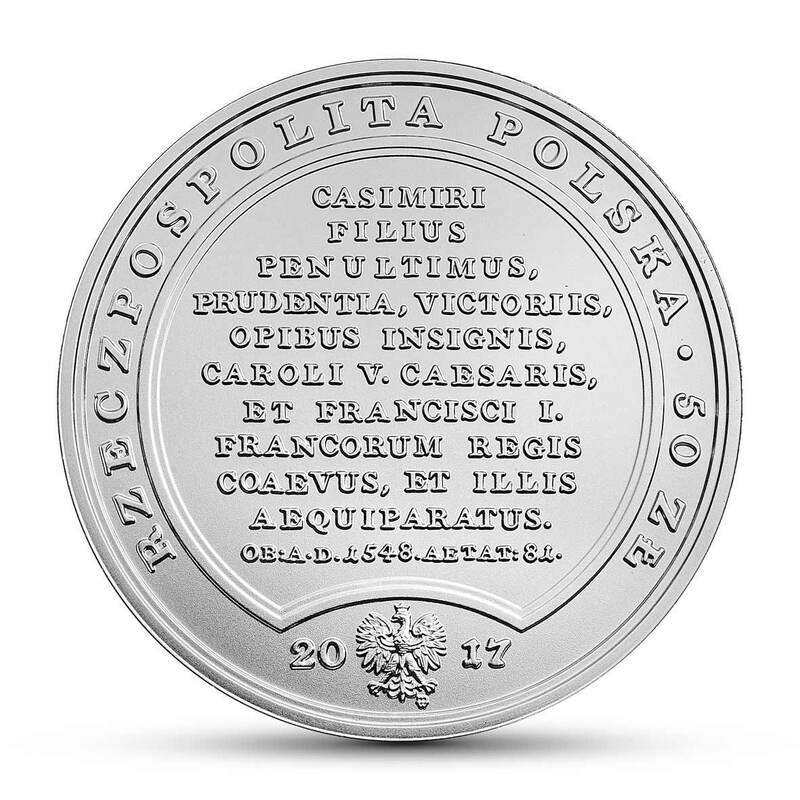 To gain funds for the country’s defences from taxes, the nobility were granted new privileges (1496, the Piotrków Statutes). Important changes took place in the Polish parliamentary system – the former Privy Council was transformed into the Senate and the noblemen’s council conventions into the Chamber of Deputies of the Sejm. This lay the foundations of the so-called “noble democracy”. John Albert died without issue and was buried in Wawel. His heart was laid in Ss. Johns’ Cathedral in Toruń. 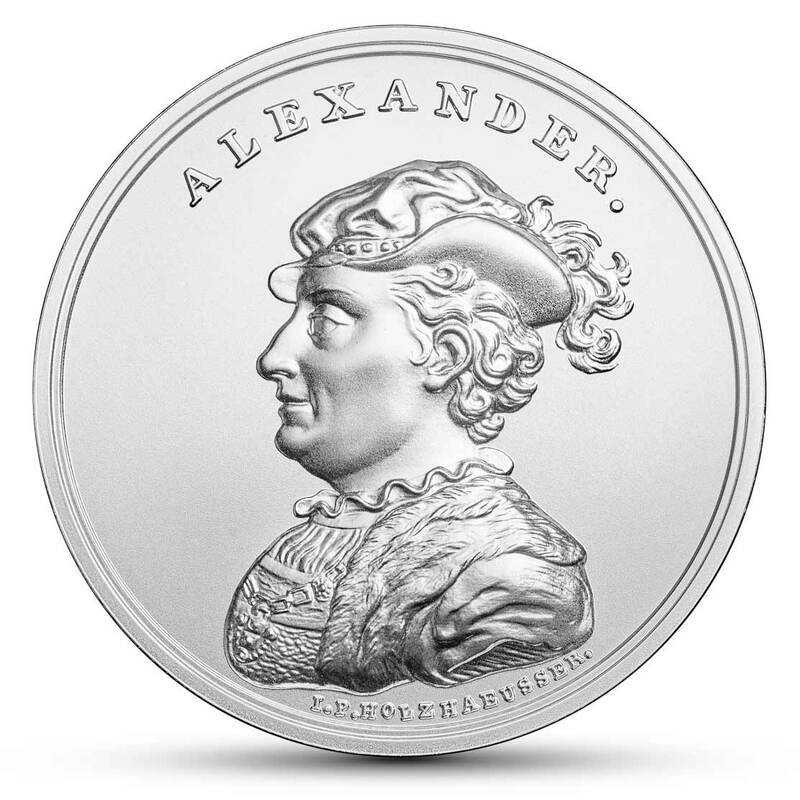 The eleventh coin of the series portrays Alexander, the fourth son of Casimir Jagiellon and Elisabeth of Austria. Grand Duke of Lithuania from 1492 and King of Poland from 1501. The Polish-Lithuanian personal union was restored upon Alexander’s coronation. The king was reproached for ineﬀective foreign policy, submission to the magnates and mismanagement of the royal estate and treasury. 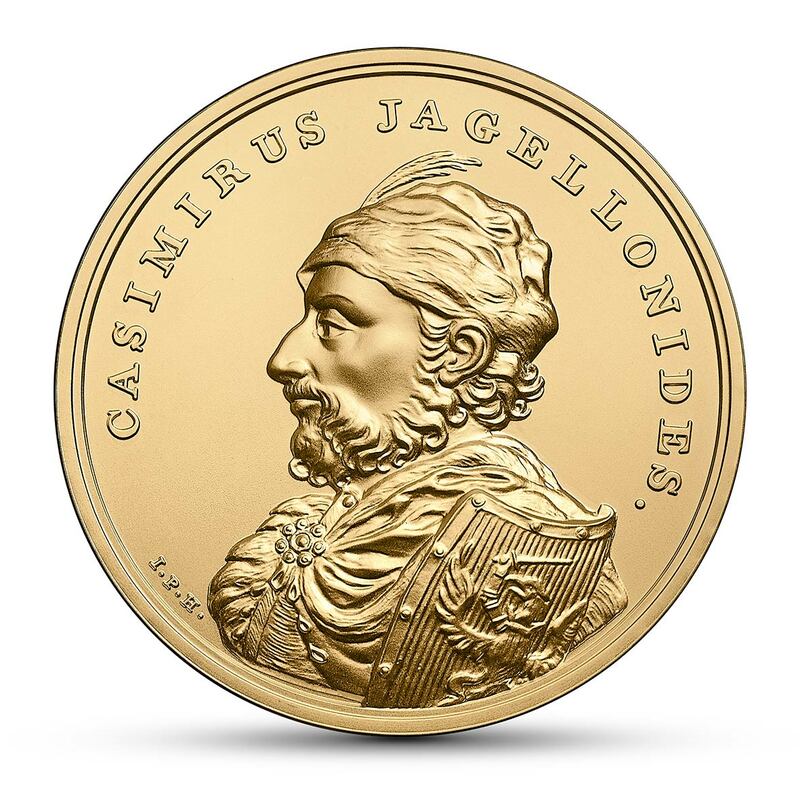 The coin’s reverse depicts the king’s bust based on the medal, shown in profle facing lef (modelled on a painting by Marcello Bacciarelli). The king is wearing a beret with an ostrich feather; he is dressed in a fur coat and a cafan underneath, over which the king is wearing a chain with a pendant. 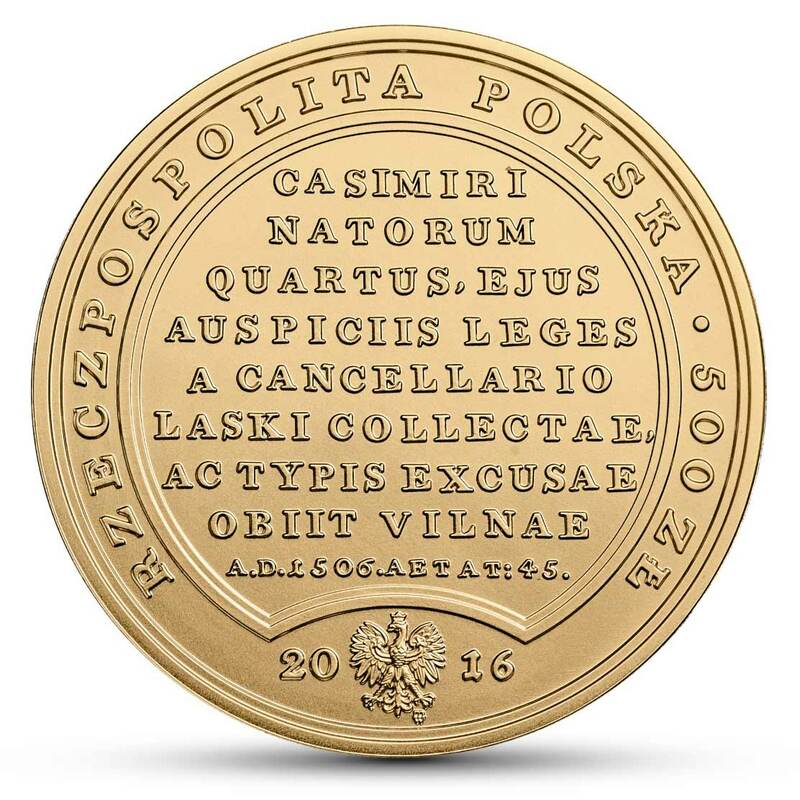 The coin’s obverse reads in translation (the text from the medal’s reverse is slightly abbreviated): Casimir’s fourth son, by whose orders Chancellor Łaski consolidated and published the legislation. He died in Vilnius A.D. 1506 at the age of 45, in the 5th year of his reign, on 19 August. drawn up a collection of laws, statutes and privileges, known as Łaski’s Statutes, which were approved by the same Sejm. Alexander Jagiellon died without issue in Vilnius in 1506 and was buried in Vilnius Cathedral. 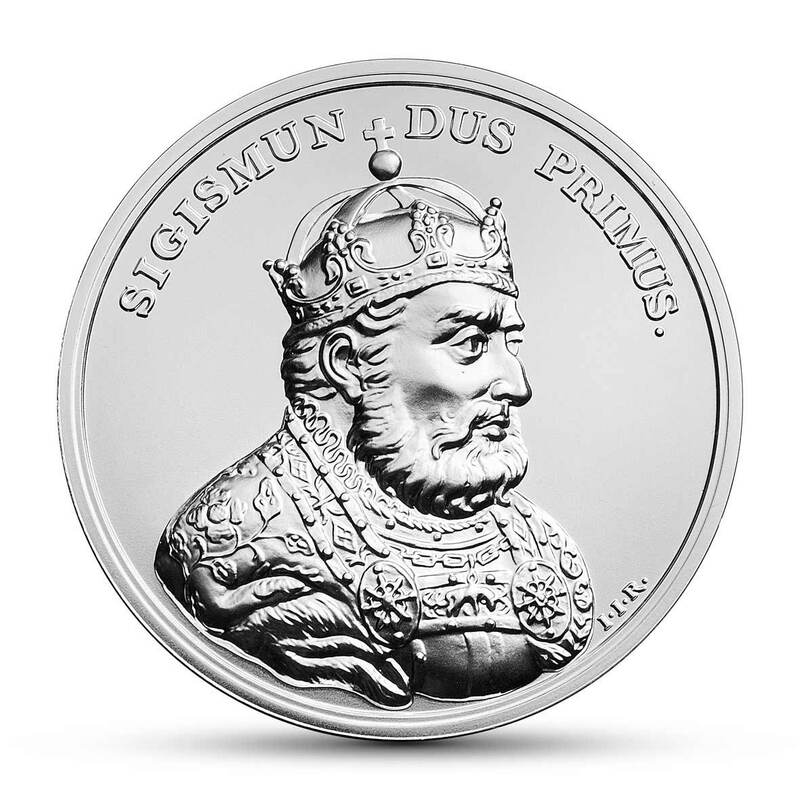 The twelfth coin in the series depicts Sigismund I, the fifth son of Casimir Jagiellon and Elisabeth of Austria. Sigismund became the Grand Duke of Lithuania and King of Poland in 1506. Following the coronation of his son in 1529, he was dubbed “the Elder”. A partisan of a peaceful solution to political conﬂicts, he enjoyed the respect of both his subjects and foreign rulers. His reign ushered Poland into its golden age – a period of economic and cultural prosperity. The reverse of the coin depicts the bust of the king modelled on a medal designed afer a painting by Marcello Bacciarelli. The bust faces right, the king is wearing a crown and has a short beard over a ruﬀ. He is clad in armour covered with a richly embroidered coat clipped with a decorative buckle and adorned with a jewelled Order of the Golden Fleece on a chain. 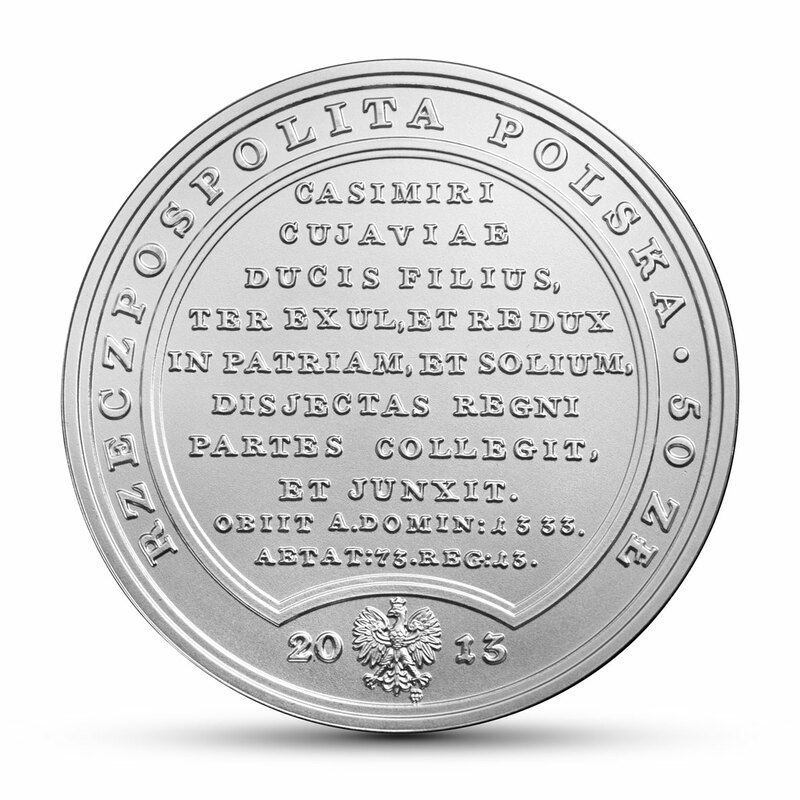 This is the frst medal in a series struck by Jan Jakub Reichel, the new court medal minter of Stanisław August (his predecessor in this post, Jan Filip Holzhaeusser, died in 1792). On the obverse of the coin we can read a slightly shortened version of the text engraved on the reverse of the medal (in translation): Casimir’s penultimate son, distinguished by sagacity, triumph and wealth, a contemporary and equal of Emperor Charles V and Francis I of France. Died AD 1548, aged 81, in the 42nd year of his reign, on 1 April. Sigismund was born in 1467. He married Barbara Zapolya (1512) and, afer her death, Bona Sforza d’Aragona (1518). In 1499–1506 he held the title of Prince of Głogów. Elected King of Poland in December 1506, Sigismund was crowned in Kraków in January 1507. He reorganised and strengthened the Treasury and ensured increased Crown revenue from duty collection and the salt works. In 1515, he concluded an alliance with the Habsburgs. In 1526, the king incorporated the fefdom of Masovia into the Polish Crown. He carried out an election vivente rege of his son Sigismund Augustus in 1529, and soon aferwards established in Poland the election viritim (all noblemen being entitled to vote on the condition of presenting themselves at the election site). As a result of wars fought in 1507–1508 and 1512–1522 (and despite the victory at Orsza in 1514), Lithuania lost Smoleńsk to Muscovy. Following the war with the Teutonic Order (1519–1520), in 1525 Sigismund accepted the liege homage from Albrecht Hohenzollern, the Prince of Prussia (previously the Grand Master of the Teutonic Order). The king modernized the monetary system and integrated the Prussian coin into it in 1526. Sigismund was a generous patron of Renaissance art and remodelled Wawel Castle. He died in 1548 and was buried in Kraków on Wawel Hill. 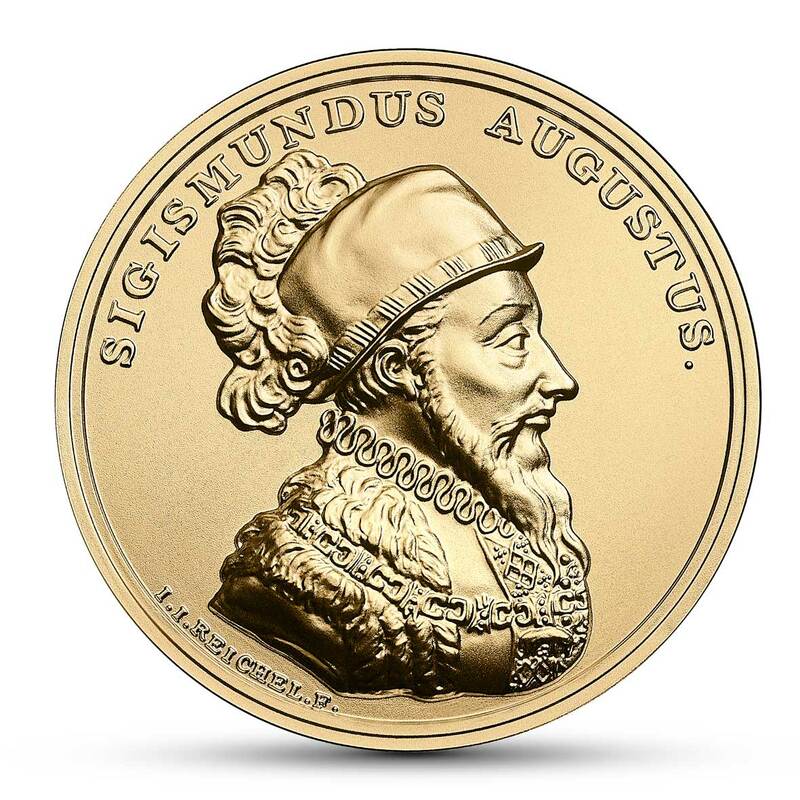 The thirteenth coin of the series depicts Sigismund-Augustus, the son of Sigismund the Elder and Bona Sforza d’Aragona, from 1529 the last independent Grand Duke of Lithuania, the King of Poland formally crowned in 1530 (vivente rege election of 1529) and reigning from 1548, following the death of his father. He was the last king from the male line of the Jagiellonian dynasty. He acquired Livonia as a fef and joined Poland and Lithuania in a union; he was distinguished by his tolerant attitude in matters of faith, he cared about the prestige of the state and was a patron of the arts. The reverse of the coin presents the bust of the king transferred from a medal (based on a painting by Marcello Bacciarelli), in profle facing right, with a mustache and a split beard, in a Spanish costume – a small stiﬀ hat with ostrich feathers, a ruﬀ and a coat with an impressive sable fur collar, and a chain with the Order of the Golden Fleece on his neck. 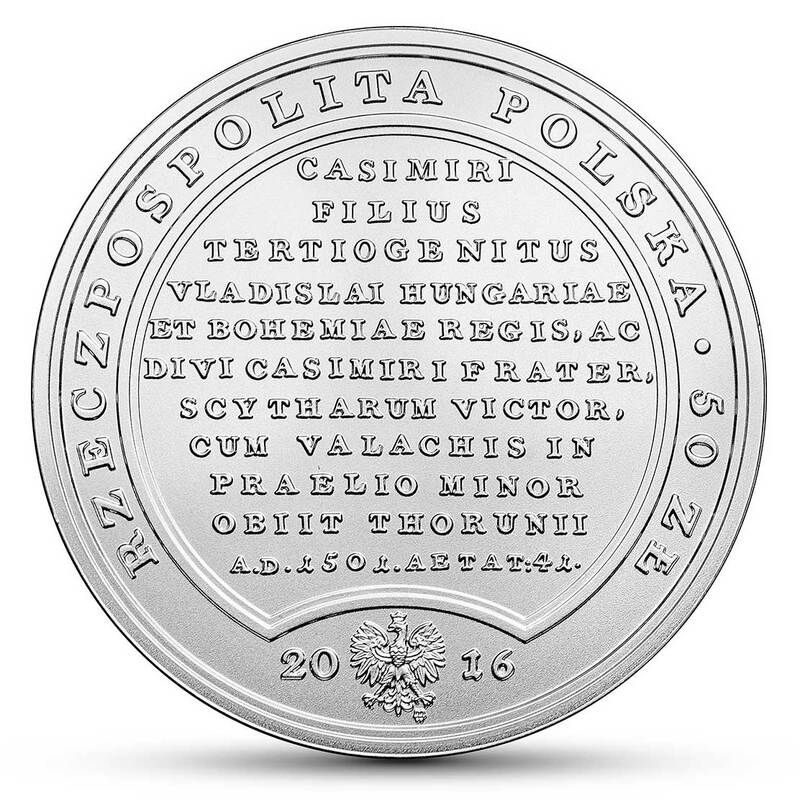 The obverse of the coin carries a slightly shortened version of the text from the reverse of the medal (in translation): The only son of Sigismund the Elder and Bona Sforza, during his father’s life he was elected as king at the age of ten, afer the death of his father he acquired Courland as a fef of the Commonwealth and he joined Lithuania and Poland in a lasting union, the last King of Poland from the Jagiellonian dynasty. He died childless in Knyszyn on the 18th of July Anno Domini 1572, at the age of 52, in the 24th year of his reign. 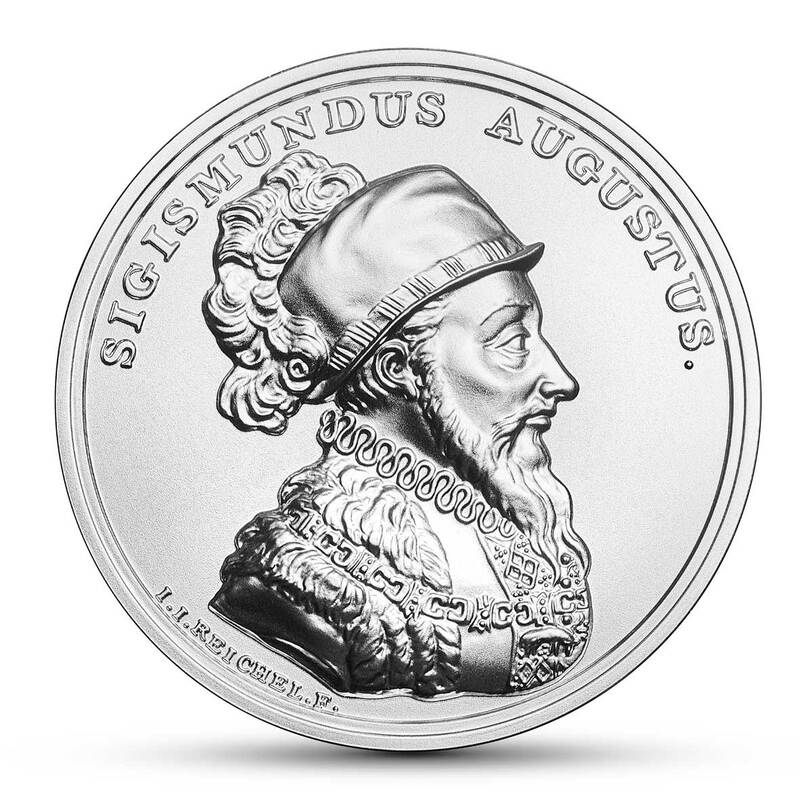 Sigismund-Augustus was born in 1520. He was married three times. In 1543, he married Elizabeth of Austria (died in 1545). In 1547, he married Barbara Radziwiłł (crowned in 1550, died in 1551) against the will of his parents and of the Polish Sejm. In 1553, Sigismund-Augustus married Catherine of Austria (they separated in 1563, she died in 1572). As a result of wars with Russia, in 1561 he acquired Livonia as a fef of the Kingdom of Poland, along with the secular Duchy of Courland and Semigallia established there and ruled by Duke Gotthard Kettler, the last Master of the Livonian Order of Knights. He began the development of the Polish ﬂeet. He carried out many economic and military reforms, and the survey and so-called recovery of property – estates previously given to magnates were restored to the state treasury. The most important political act during his reign was the Union of Lublin signed in 1569. It resulted in the establishment of the Polish-Lithuanian Commonwealth, also known as the Commonwealth of Both Nations – from that point on Poland and Lithuania had a single ruler, a common foreign policy, a common Sejm and a single currency, while retaining separate laws, treasuries, ofces and armies. The King died childless in 1572 in Knyszyn and was buried in a solemn ceremony at Wawel Castle. The fourteenth coin in the series depicts Henry Valois. Born in 1551, he was the fourth son of the French King Henry II and Catherine de Medici, and the last French monarch of the Valois dynasty. He was the frst elected monarch of the Polish-Lithuanian Commonwealth. Valois was elected in May 1573 following the heirless death of the last king from the Jagiellonian dynasty Sigismund II Augustus. He arrived in Poland at the end of January 1574, and his coronation took place at the Wawel cathedral on 21 February. Afer learning of the death of his brother Charles IX, who was the King of France, he lef Poland on the night of 18-19 June 1574. He was crowned the King of France as Henry III in 1575 in Reims. On the reverse the coin depicts the bust of the king transferred from a medal (according to a painting by Marcello Bacciarelli) with the profle facing right, in a velvet hat with ostrich feathers and a brooch pinned above the forehead, with a curled mustache and a small beard, with an earring in his right ear; in a decorative French robe with a lace collar, in a coat and with the Order of Saint Michael on a ribbon. 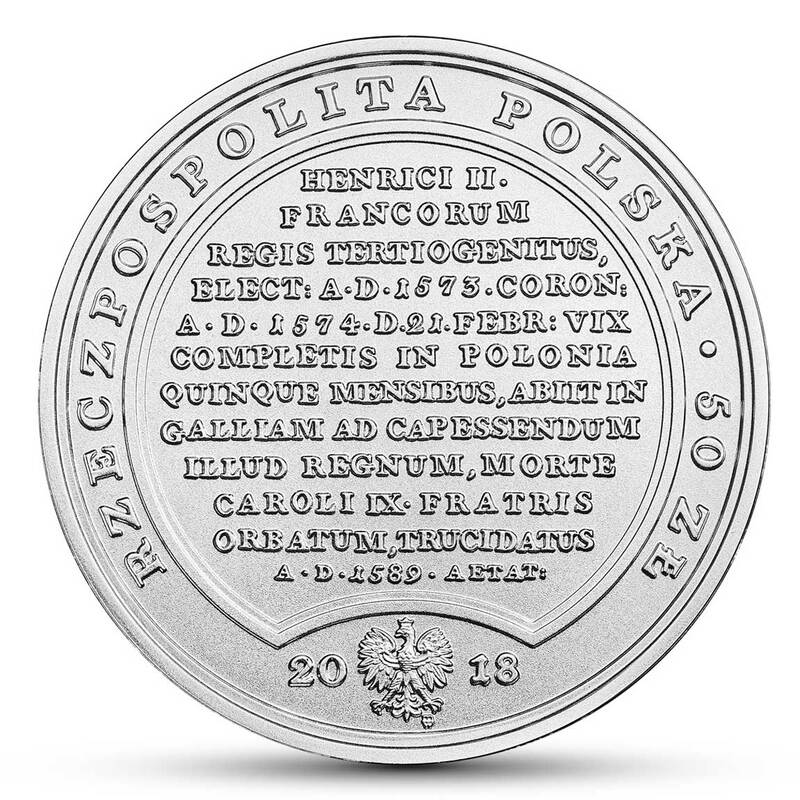 The obverse of the coin carries a slightly shortened version of the text from the reverse of the medal (in translation): The third son of the French King Henry II, elected Anno Domini 1573, crowned on the 21st day of February Anno Domini 1574, afer only fve months in Poland he lef for France in order to take the throne of that kingdom, orphaned afer the death of his brother – Charles IX. He was murdered on the 2nd day of August Anno Domini 1589, at the age of 38. During the bloody religious war taking place in France, Henry Valois won the frst Polish free election, even though he didn’t know the institutional system and the politics of the Polish-Lithuanian Commonwealth and wasn’t interested in them. He swore to abide by the legal acts prepared by the Election Sejm. These were the so-called Henrician Articles, which regulated the principles of the king’s reign (and guaranteed the basic rights of the nobility), the provisions of the Warsaw Confederation which guaranteed religious tolerance, and the pacta conventa – the personal pledges of the ruler regarding politics, the economy and culture. Henry Valois was widely criticized for his proﬂigacy and promiscuous lifestyle. He failed to fulfll his promise to marry Infanta Anna Jagiellon, the sister of Sigismund II Augustus. 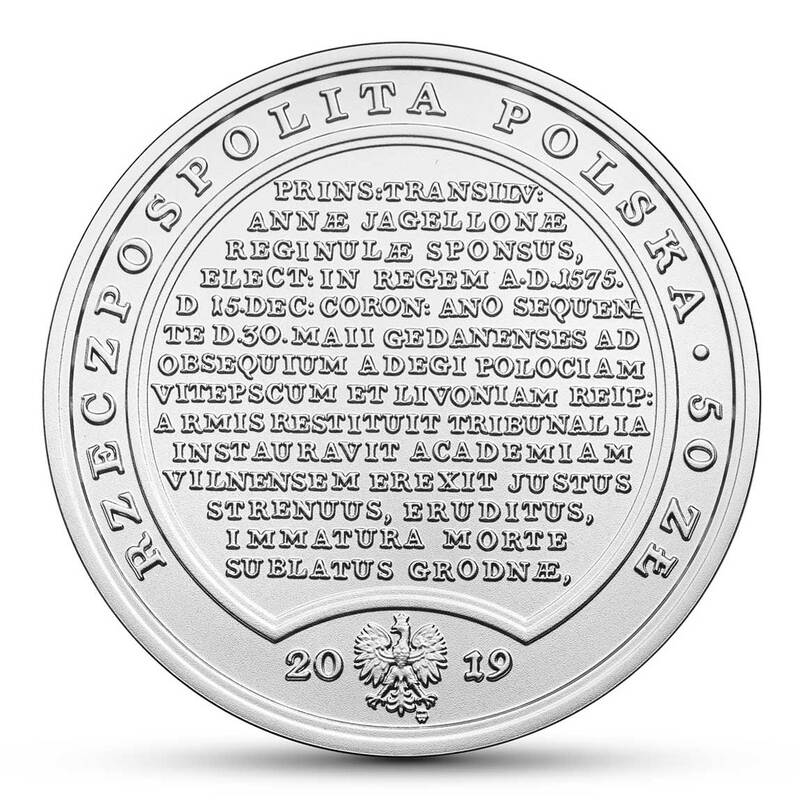 A year afer his departure from Poland, in June 1575, a state of interregnum was proclaimed in Poland and the nobility chose Anna Jagiellon as his successor. Despite that, Henry III continued to use the titles of the King of France and the King of Poland until the end of his life. He was stabbed to death during religious feuds in 1589. His grave is located in the Basilica of Saint Denis in Paris. 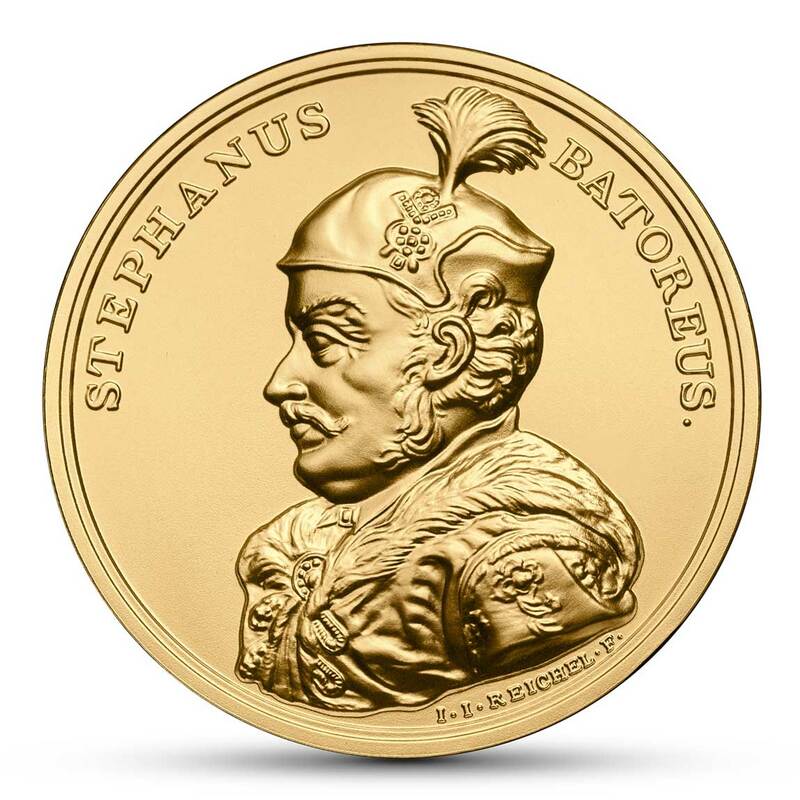 The ffeenth coin of the series carries the image of Stephen Bathory (Báthory István), the son of the Voivode of Transylvania and Prince of Transylvania from 1571, acclaimed King of Poland by the noblemen in December 1575. On 1 May 1576, he married Anna Jagiellon, who had been elected King of Poland a year before, whereby he acquired the right to the throne and was crowned in Kraków. He is regarded as one of the most outstanding Polish rulers. The reverse of the coin features the king’s bust modelled on a medal (designed afer a painting by Marcello Bacciarelli). The bust faces lef, the king has a moustache, and is wearing a traditional Hungarian woollen cap decorated with feathers, a zhupan, and a delia cloak with a fur collar and buttons, clasped with a round fbula. 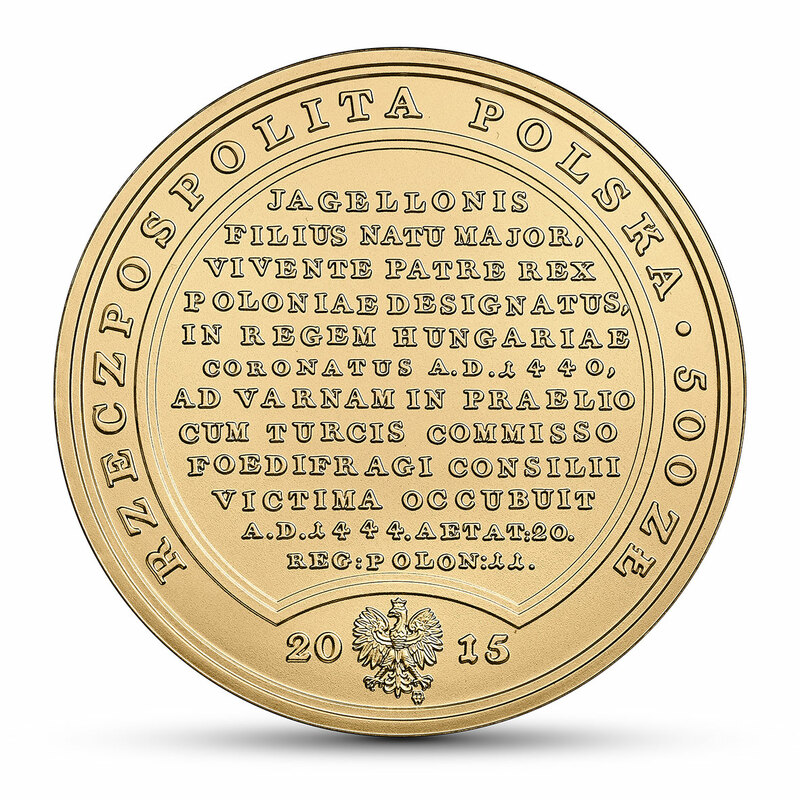 The obverse of the coin features a slightly shortened version of the text engraved on the reverse of the medal (in translation): Prince of Transylvania, spouse of Princess Anna Jagiellon, elected king A.D. 1575 on the 15th day of December, crowned the following year on the 30th day of May; forced the residents of Gdańsk into submission, militarily reincorporated Polotsk, Vitebsk, and Livonia into the Republic of Poland, established tribunals, founded the Academy of Vilnius; just, valiant, educated, snatched by untimely death A.D. 1586 in Grodno, at the age of 54, in the 11th year of his reign, on the 12th day of December. Stephen Bathory was born in 1533. He received a thorough education in Austria at the Habsburg court, and in Italy. In Hungary, he was involved in fghting the Turks and Habsburgs, who were occupying the country. As the ruler of Poland, he strived to strenghthen the king’s power. Having come to the throne, he forced the supporters of emperor Maximilian II Habsburg, who was running against him for king, into submission. In 1577, he defeated the mercenary troops of Gdańsk, which had opted for the Habsburg. Gdańsk, however, maintained complete autonomy for the price of accepting the election result and awarding the king half of the fees imposed on ships and goods entering the port (mooring fee). Bathory made a particular contribution in the military field. He organised, amongst others, the Peasant Infantry. He conducted victorious campaigns against Moscow, conquering Polotsk and Velikiye Luki. The Truce of Yam-Zapolsky in 1582 strengthened the rule of the Republic of Poland in Livonia and expanded the borders of Lithuania. He planned to create an anti-Turkish league based on cooperation between European states in order to liberate Hungary. In domestic policy, he improved the tax system and set up new mints. He also established further Tribunals – the Crown Tribunal (1578) and the Lithuanian Tribunal (1581). In 1579, he founded the Academy of Vilnius. He was tolerant of religious beliefs. He died in 1586 and was buried on Wawel Hill, where his tombstone by Santi Gucci is placed in St Mary’s Chapel. 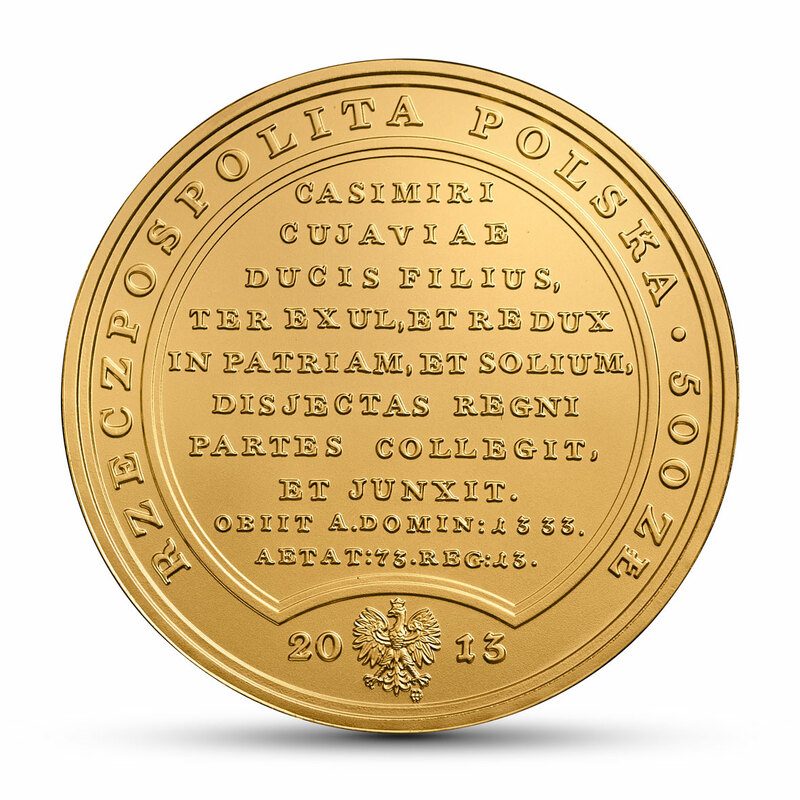 The unique series of gold and silver collector coins with the face values of 500 zloty and 50 zloty – “TREASURES OF STANISŁAW AUGUST” – replicates the famous 18th century medallic series with the images of the kings of Poland, which was struck on the order of Stanisław August Poniatowski. 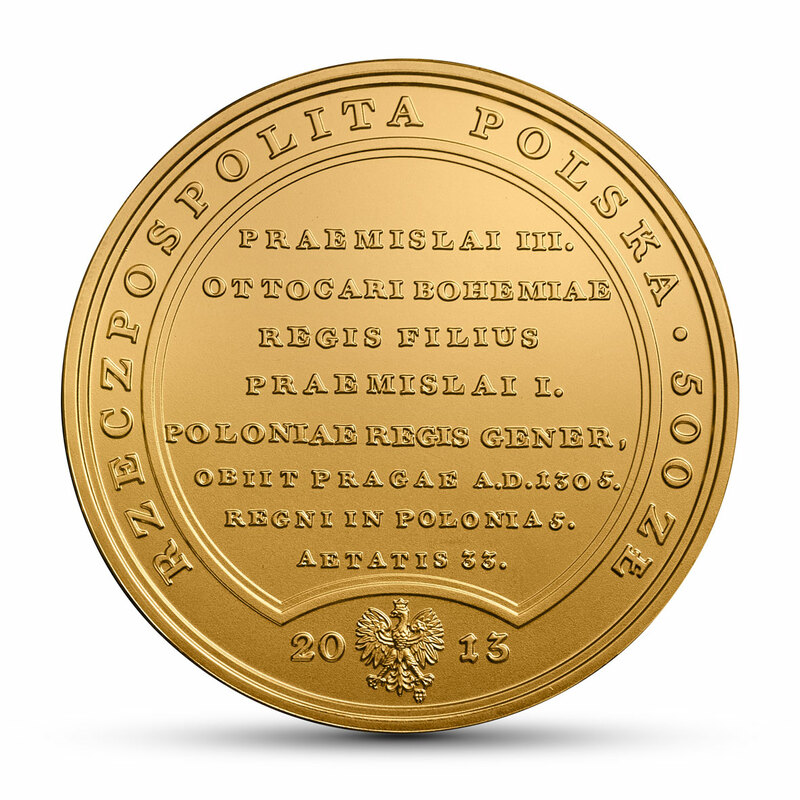 The royal medals, designed by two outstanding medallists: Jan Filip Holzhaeusser and Jan Jakub Reichel, were struck at the Warsaw mint in the years 1791-1797/1798. The design of the medals was based on portraits painted between 1768 and 1771 by Marcello Bacciarelli for the Marble Room at the Royal Castle in Warsaw. The coins issued by the National Bank of Poland are faithful replicas of the medals, preserving the diameter and height of relief of the originals. This applies to the portraits of the kings on the reverses. 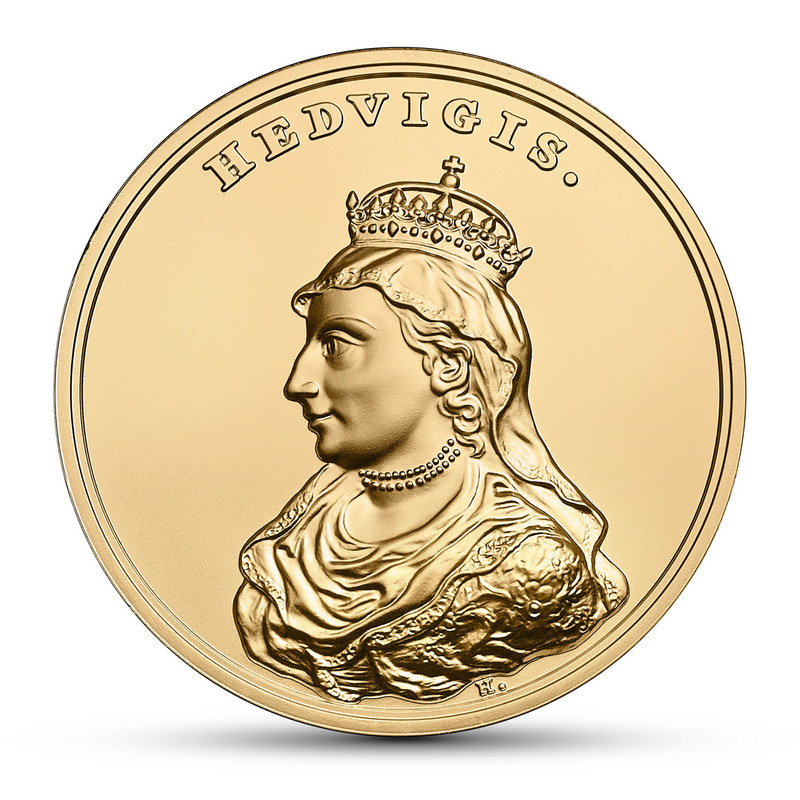 The obverses of the coins feature the reverses of the medals with biographies of the monarchs. 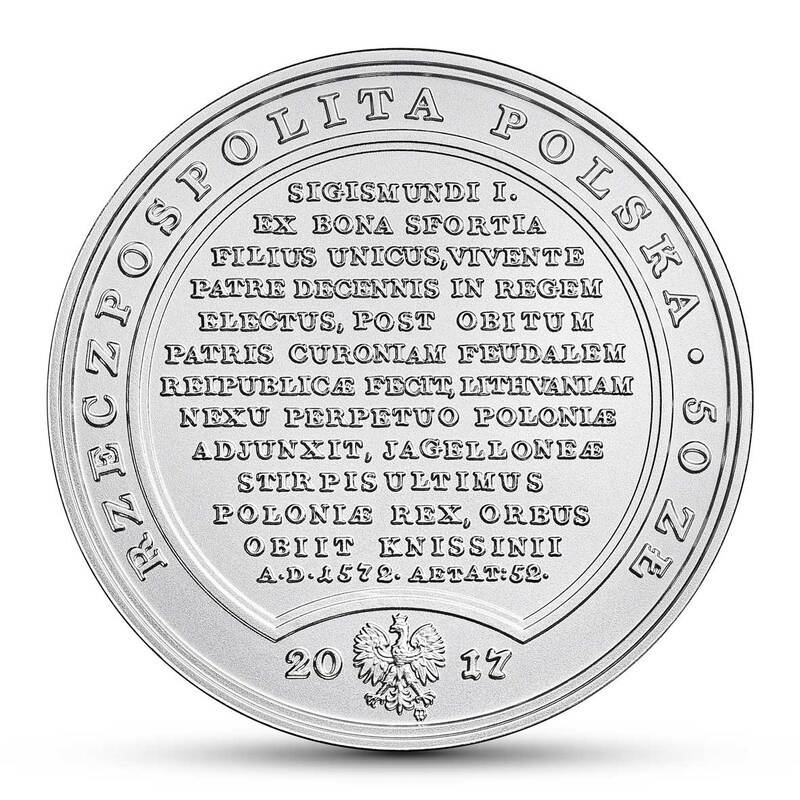 The reverses of the medals have been reduced in size because they are accompanied by the name of the state along the rim, the image of the state emblem, the face value and the year of issue of the coins. The biographies of the monarchs and the inscriptions on the obverses of the medals accompanying the royal portraits are in Latin. The final text editing was most likely done by King Stanisław August himself. 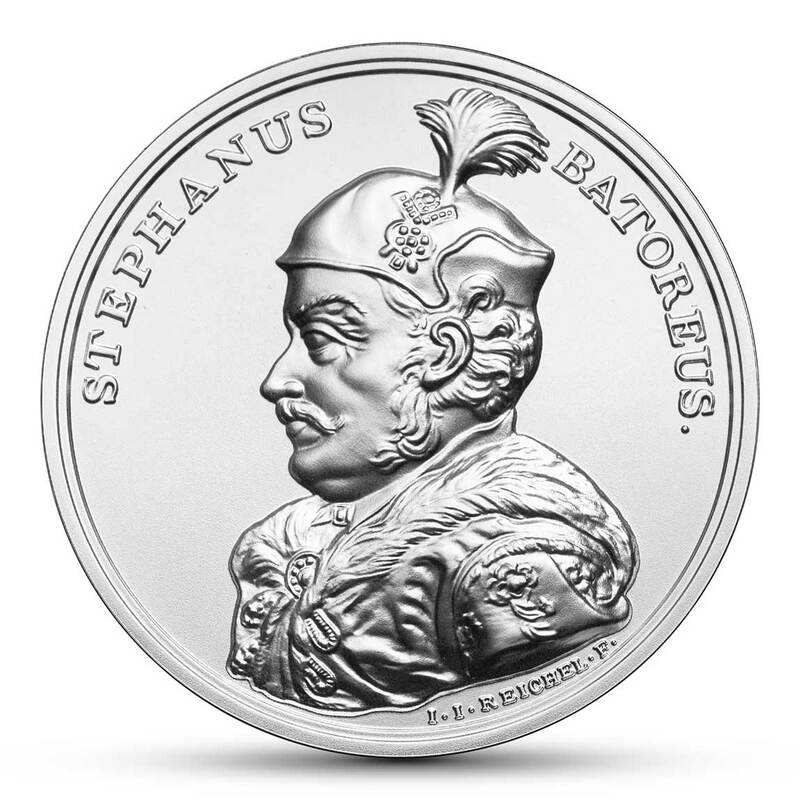 The names of the monarchs in Polish are presented on the sides of the coins, along with the name of the series “Treasures of Stanisław August”. The gallery of portraits of Polish kings, painted on the order of Stanisław August Poniatowski, consisted of images of 23 monarchs. 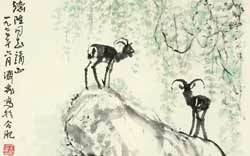 It included one royal portrait more than Bacciarelli’s series of 22 paintings. The additional portrait of Stanisław Leszczyński – featured on the medal – was most probably modelled on a painting by Jan Bogumił Plersch. Both series, the paintings and the medals, begin with the image of Bolesław Chrobry and end with the portrait of August III. Since the 18th century, the principal place in the Marble Room has belonged to the portrait of the full-length figure of Stanisław August in his coronation robes. The painting is several times larger than other portraits. 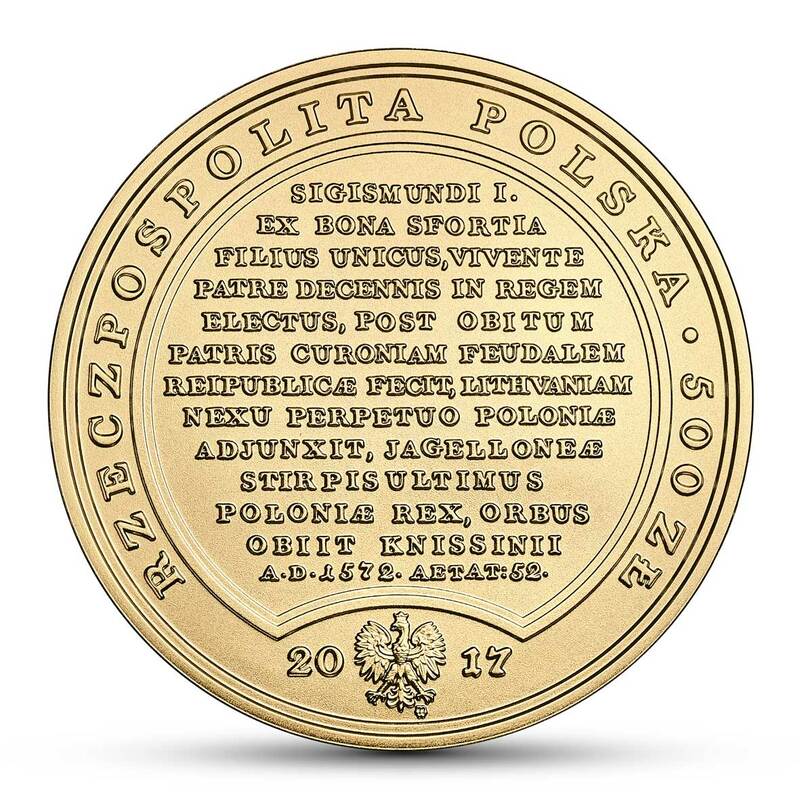 It is therefore probable that the medallic series would have finished with a medal presenting the image of the ruling monarch. However, these plans were thwarted by the king’s abdication, emigration and early death at the beginning of 1798. 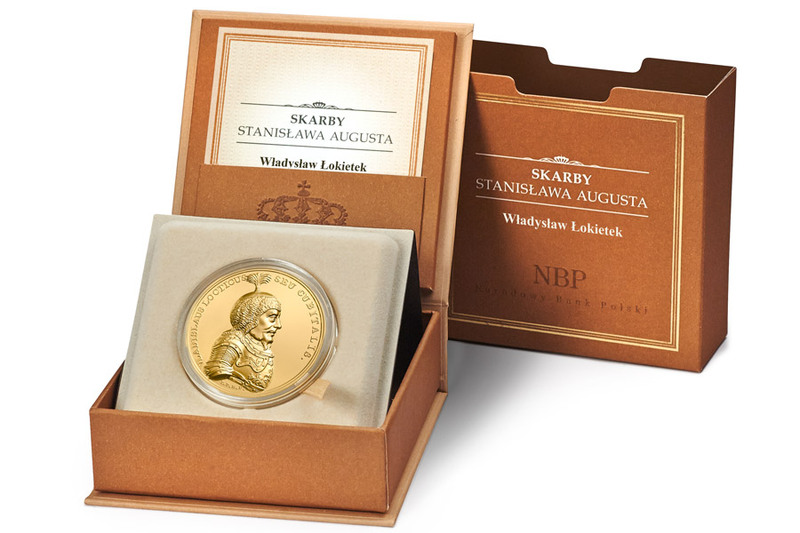 The series of coins “Treasures of Stanisław August” consists of 24 portraits of monarchs – of which 23 have been modelled on the royal series plus a portrait of Stanisław August based on the medals from the period. 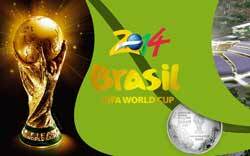 The series will be struck in silver and gold, as was the practice in the 18th century. 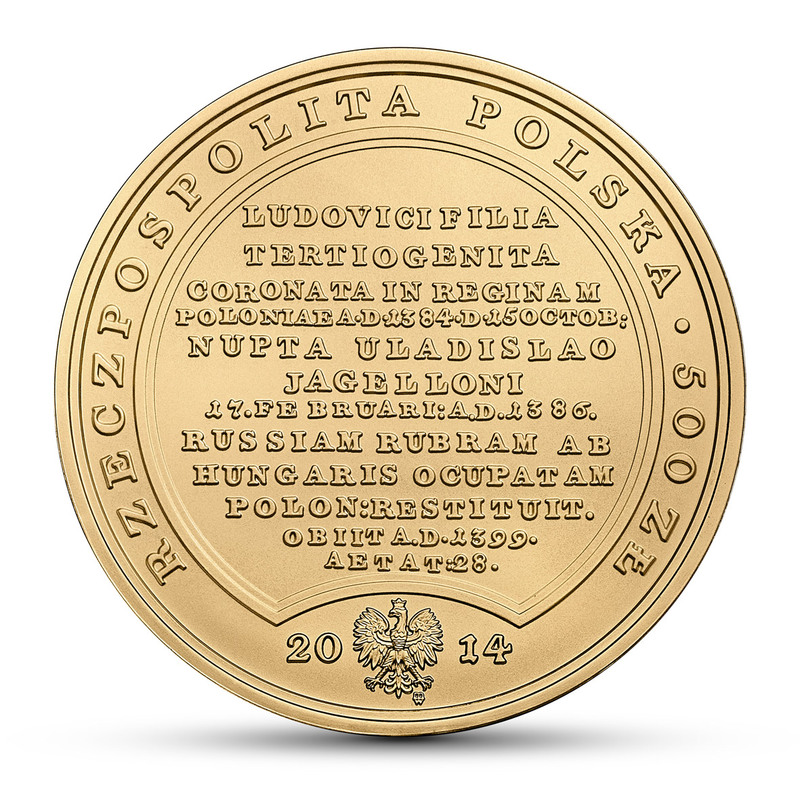 Starting from 2013, the National Bank of Poland will issue the coins from the series four times a year. Where do you buy the box for this incredible series? Gdzie kupisz pudełko na tę niesamowitą serię?